The 105mm Howitzer Motor Carriage M7 was a powerful invention to support infantry forces during World War II with a combination of a heavy artillery gun, tracked mobility and armor. Christened the ‘Priest’ by British forces due to its round pulpit-like machine-gunner’s ring, the M7 saw service in North Africa, Italy and Normandy and had a powerful showing during the Battle of the Bulge in the winter of 1944-1945. I’ve been wrapping up a bunch of lingering modelling projects at multiple scales for the past two months, and I found I still had a number of 6mm models from GHQ to wrap up. Every time I go back to 6mm from my usual 15mm and 28mm modelling, I’m reminded of how much I love working at the micro armour scale. I’m a big fan of how Priests look with their boxy profile and huge gun, and even at the micro scale the GHQ M7 models have a bunch of detail. Finishing these models involved just a quick shot of olive drab armor base coat spray was followed by a brown wash and some dry brushed highlights in a lighter green. Decals add that last bit of detail before the bases are flocked and the models get a matte coat finish. 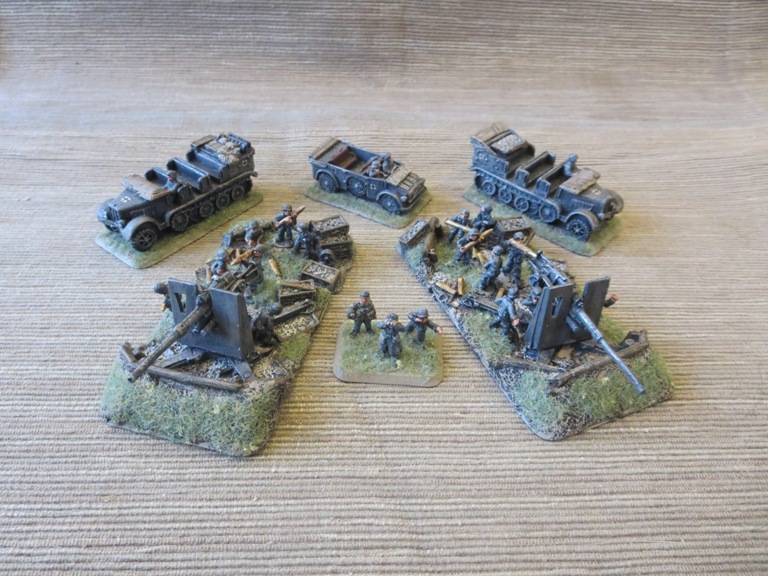 I also had a pack of GHQ US infantry heavy support weapons on hand to add to my other existing ground forces. 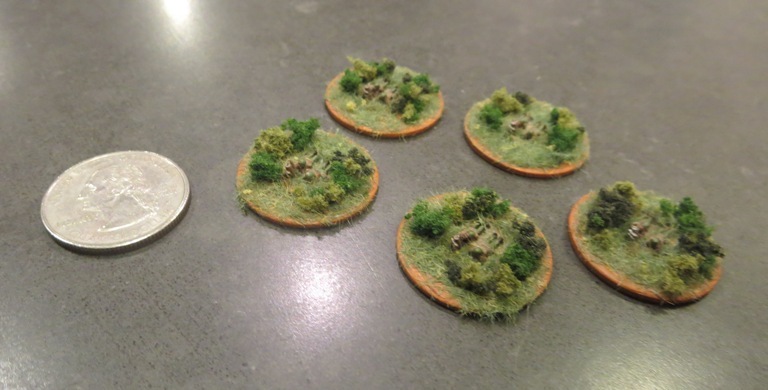 The M2 mortars and M1919 light machine guns wound up with a pretty tiny, low profile on my flocked washer bases, but they fill out my infantry with flexible support. Along with my new Priests, my tiny US force is diversely equipped for some micro action. It was clear to the Allies from the early years of World War II that German tanks were a big problem. From the early Panzer models to the medium Panthers and finally to the famed Tiger I and Königstiger, German armor combined with German tactics were major threats to Allies forces throughout the war. To help counter the German armor threat on the battlefield, the Allies quickly evolved their anti-tank weaponry. Building on earlier. lighter guns, the British introduced the “6 pounder” early in the war. 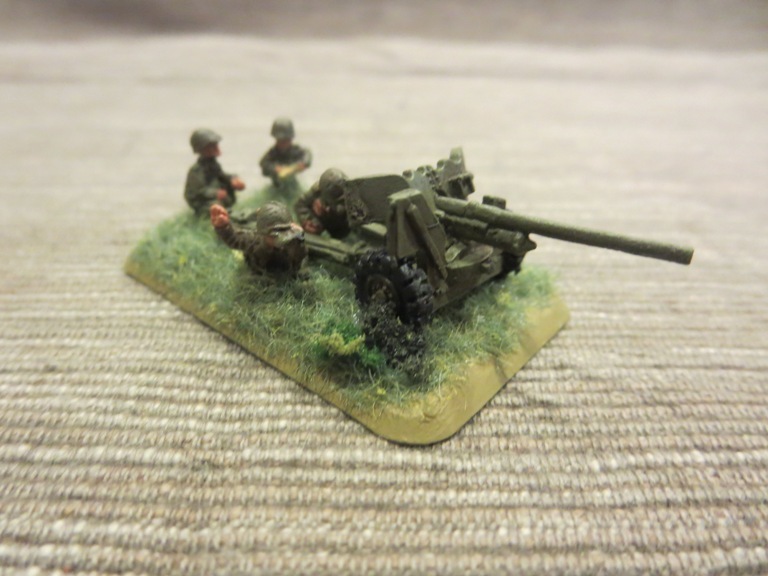 Even before entering the war, the United States began production of its version with the M1 57mm anti-tank gun which it exported for use by UK and Soviet forces. Despite the gun’s mixed effectiveness against the strongest German tanks and only occasional use against infantry, the M1 57mm became the standard Allied anti-tank gun of the war with some 15,000 produced. 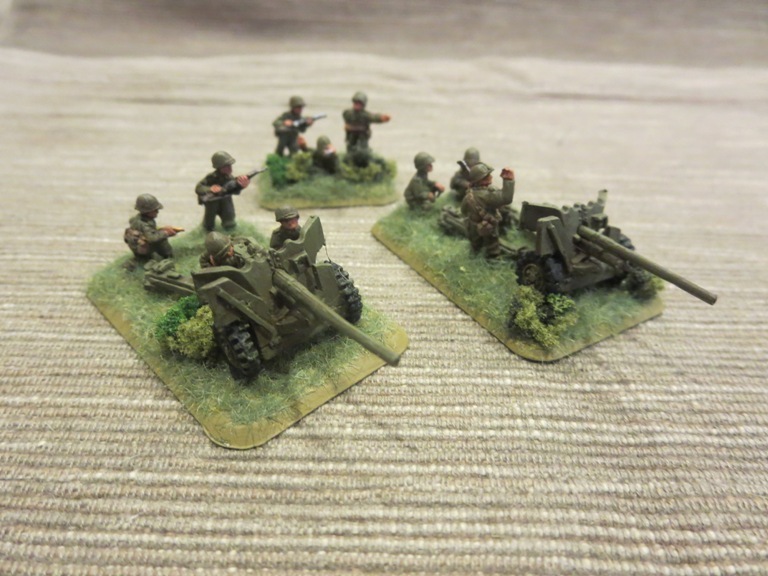 I’ve previously modeled the British 6 pounder version of these guns for Flames of War, but I wanted to add some of the American M1 57mm models to my miniatures arsenal ahead of the Sint-Oedenrode scenario I’ll be running at the upcoming Fall In! convention in November. As luck would have it, a member of Metropolitan Wargamers in Brooklyn, NY was getting rid of some extra packs of the models and I picked them up on the cheap. Getting these assembled, painted and ready for the table was a quick process. After gluing everything up and covering the bases in a layer of filler putty, they got hit with a basic olive drab spray base undercoat. Flesh and equipment details got picked out, and skin was topped off in a flesh wash. The guns themselves received a brown wash and a lightened green highlighted brush coat. 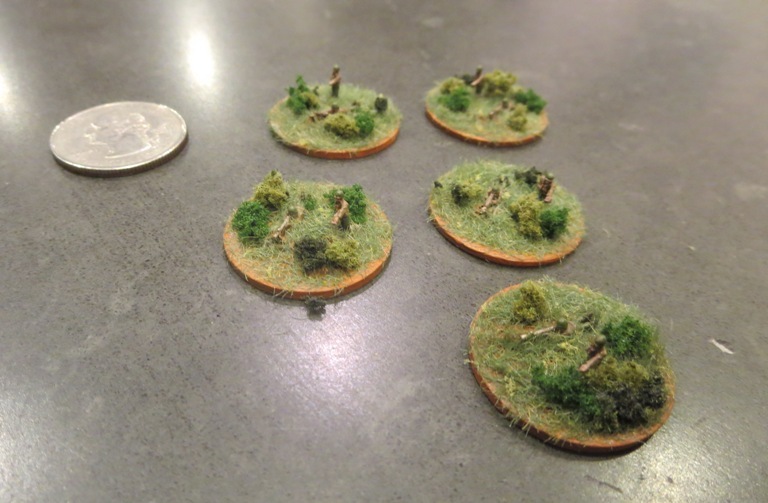 The bases were flocked, I added little bits of shrubby and then everything got a matte spray finish. The resulting four guns and two command stands gives me a lot of flexibility to add these to a lot of forces throughout the late war period I generally play. 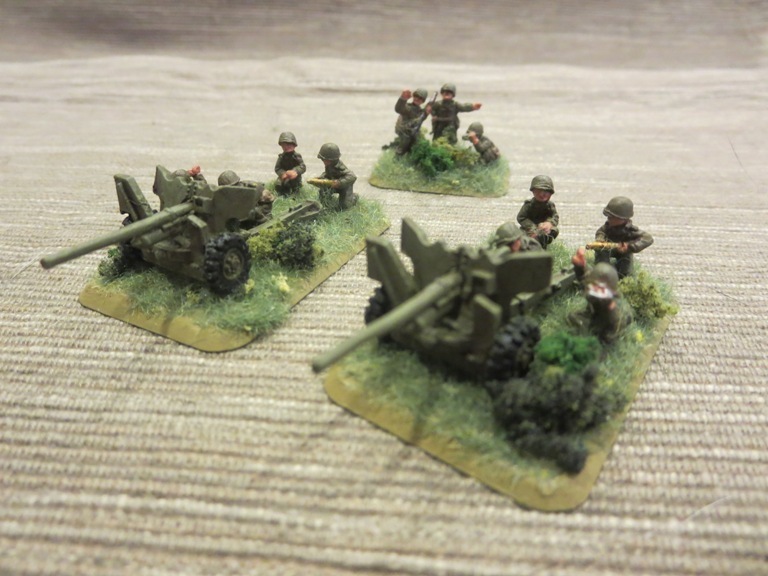 As a ubiquitous gun on the battlefields of World War II, these M1 57mm artillery pieces are certain to be making a lot of appearances in my games to come. One of the most common, flexible and deadly weapons used by German forces in World War II was the 8.8cm FlaK 36 gun. Building on earlier models from the late 1920s and early 1930s, the piece could be used for both anti-aircraft and direct anti-tank fire. 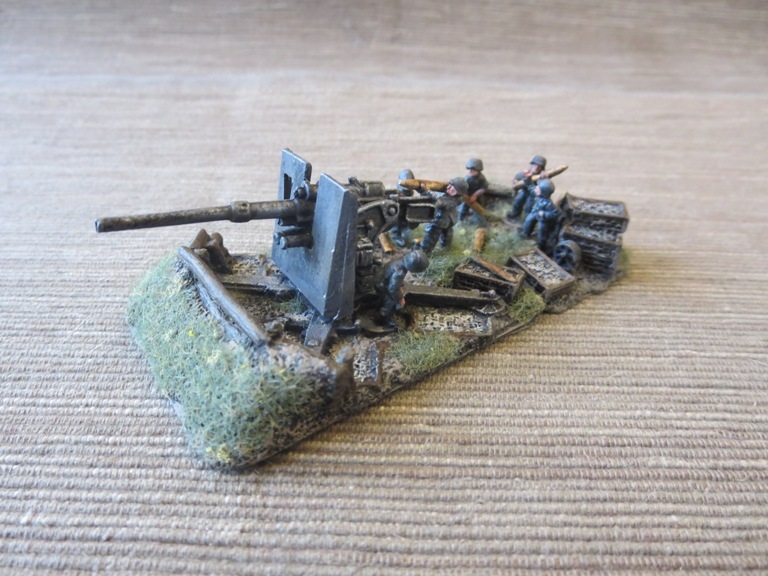 Known commonly as an “Eighty-Eight,” this iconic artillery was encountered on battlefields from Africa to the Eastern Front to the coast of Normandy in both fixed defensive positions or in support of mobile ground forces. 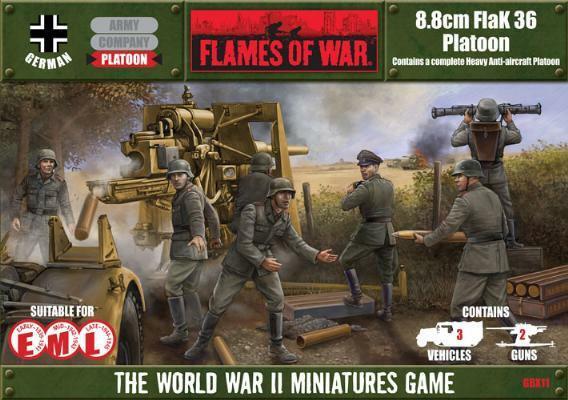 I’ve been away from modelling any Flames of War miniatures for a while, but I’m planning on running a couple historic beginner games at the HMGS Fall In! convention in Lancaster, PA in early November. 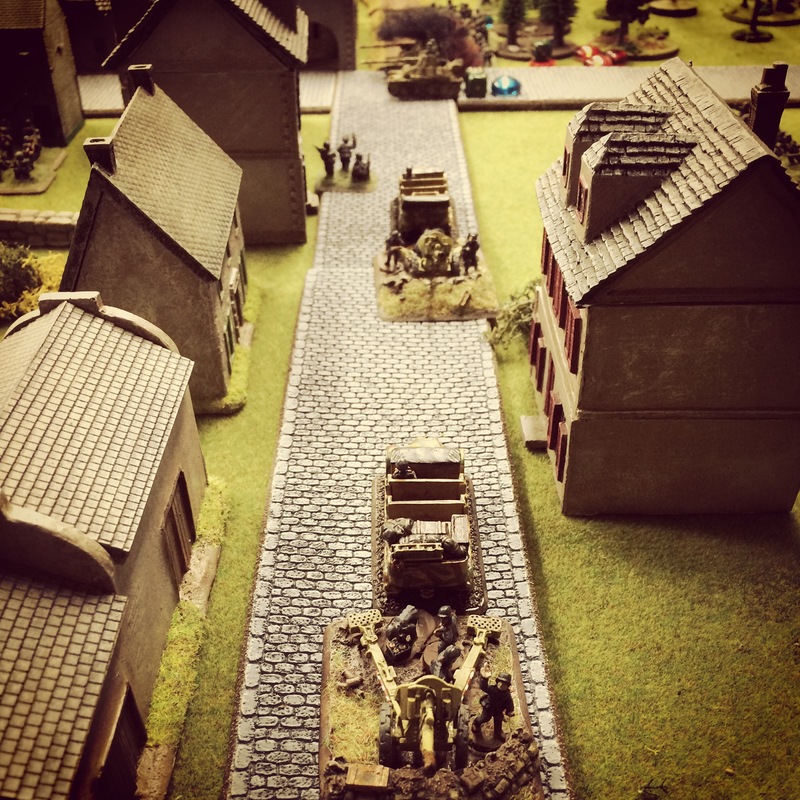 One of the scenarios, Sint-Oedenrode, requires some 88s, and I’ve long relied on loaners from other members at Metropolitan Wargamers in Brooklyn, NY. I figured it was high time I add these weapons to my 15mm collection, so I ordered the set from my go-to supplier The Warstore and the box arrived in just over a day. 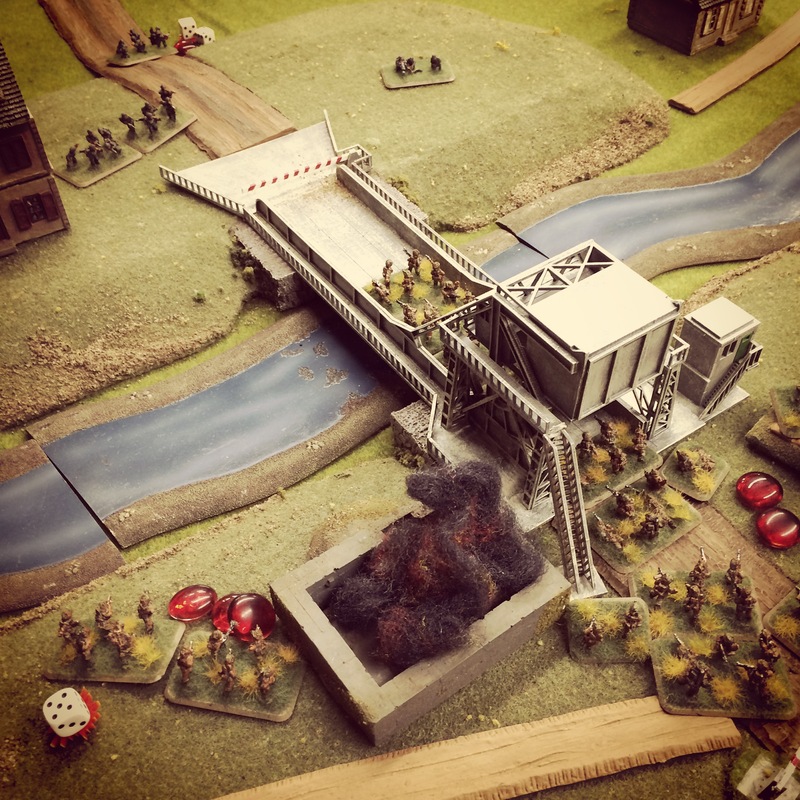 The models, including two metal 88s, a resin Sd. Kfz. 15 command car, two resin Sd. Kfz. 7 half-track tractors and a ton of crew and bits, glued up quickly on the marvelous cast scenic bases I’ve come to expect from FOW designers. 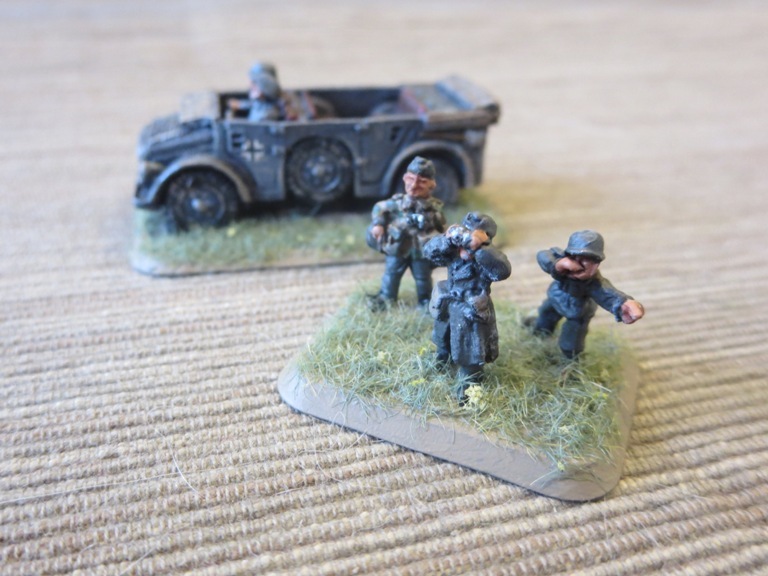 My German painting goes pretty quickly with a black spray primer coat followed by some dark grey brushed on as base for uniforms, vehicles and guns. 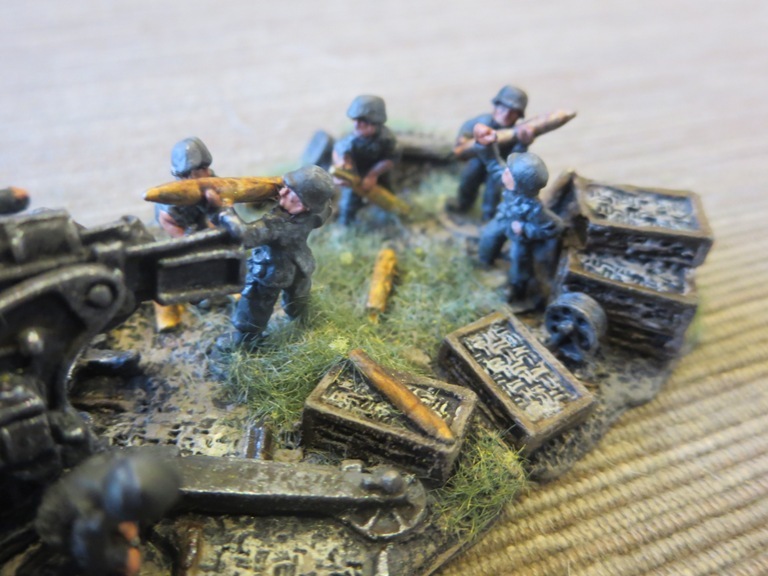 Log emplacements, ammo boxes and equipment get painted up in coats of varying browns and greys. 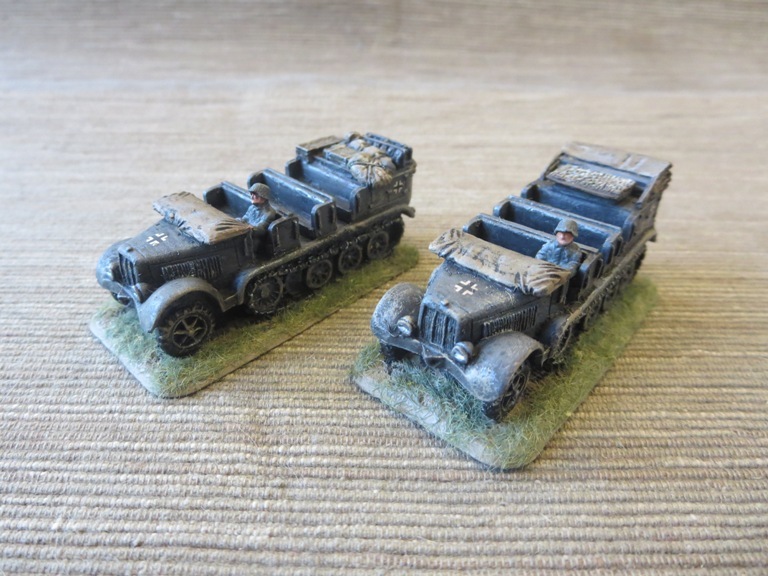 The gun and vehicle grey basecoat are washed in a dark brown and then followed up with some highlights in dry-brushed silver, light grey and brown muds. 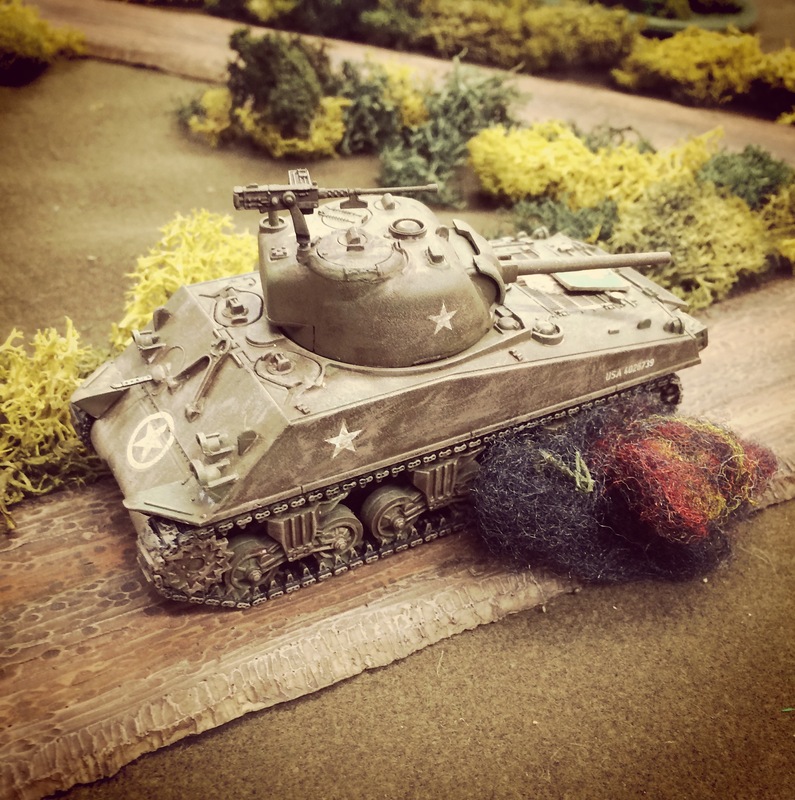 The huge shells scattered on the ground and fresh rounds in the arms of the crew are done in metallics, and the vehicles are detailed with decals. The final touches are done with static grass applied with white glue around the bases and a few sprays of matte finish to protect the models and dull down any remaining shine. In all, the entire platoon took me a couple hours. 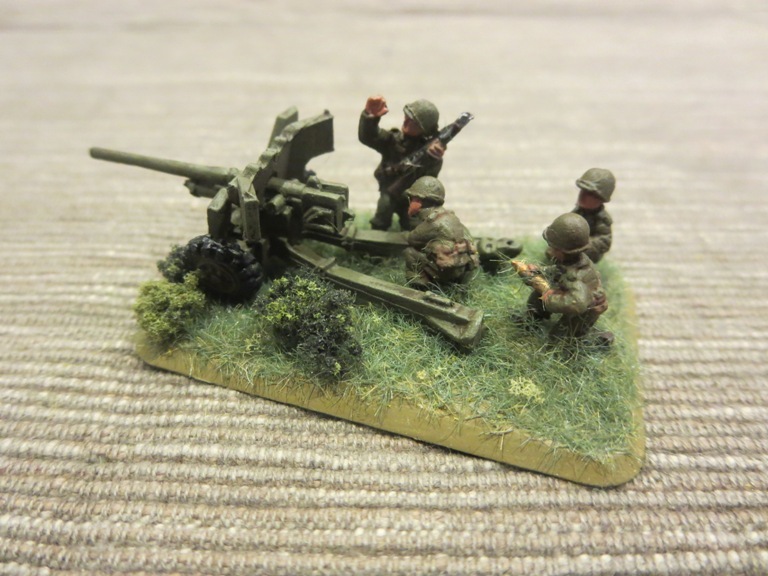 As with most FOW models, there’s a lot of personality, poses and details in this kit. I love the commander’s stance with binoculars aimed at the horizon and his junior officer reaching for his bag. The main gun bases and the extended separate bases of extra crew make each piece a little diorama of its own. By carefully applying grass to certain areas, I was able to blur the line between the bases, making them appear as one big piece with a quick look. 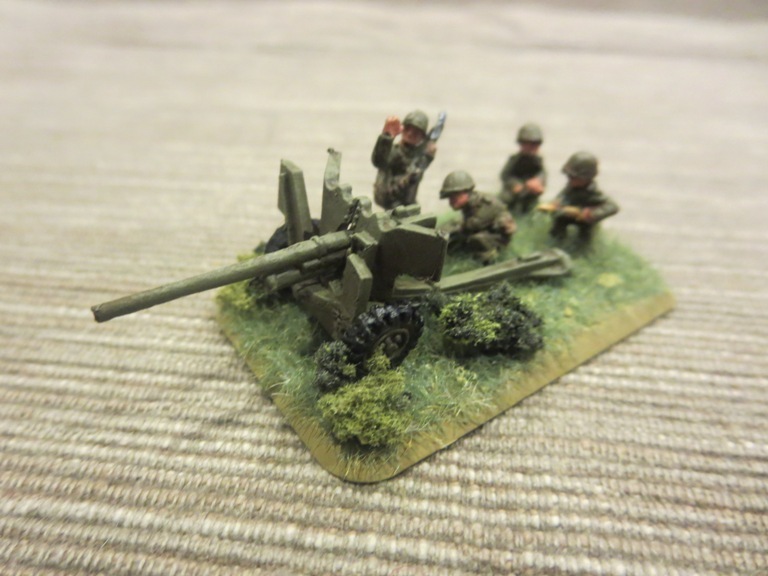 Of course, along with the detail in the models does come some cost, but the usability of these models in so many FOW games makes adding the 8.8cm FlaK 36 platoon a fantastic long-term investment. Allied airborne troops were the first units on the ground in the pre-dawn hours of June 6th, 1944 invasion of Normandy. 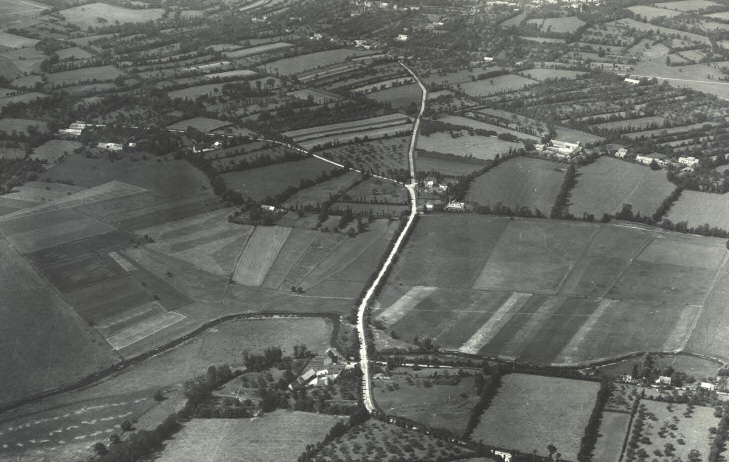 As the vanguard ahead of the massive beach landings to come on D-Day, the inland goals of the paratroopers was to secure key inland areas and deny German reinforcements a path to the coast. 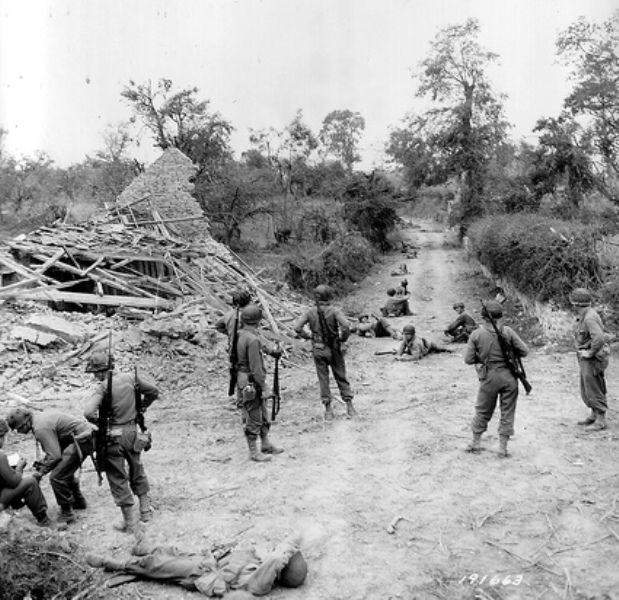 Members of the 505th Parachute Infantry Regiment of the 82nd Airborne Division were tasked with seizing a bridge over the Merderet River at La Fiere and just west of Sainte-Mère-Église. There to meet the arriving Americans were elements of the German 1057th Infantry Regiment of the 91st Infantry Division. 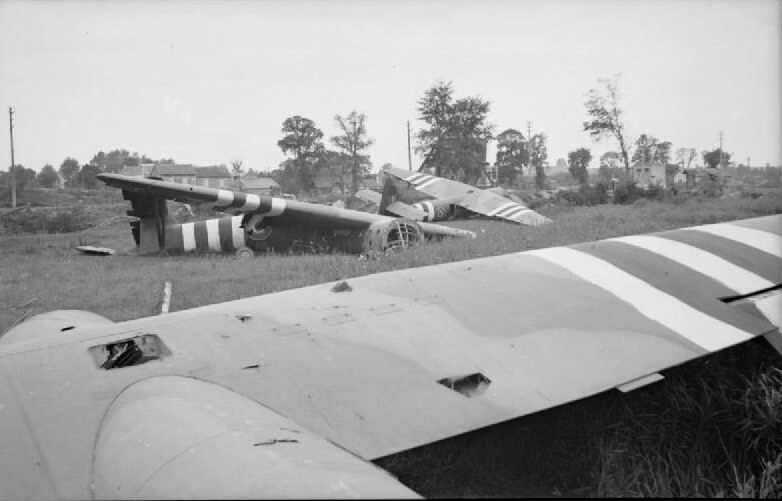 For three days, German resistance amid the open fields, bocage hedgerows and scattered stone Normandy buildings held out against the elite US airborne troops. By July 9th, however, the Germans withdrew and the way was cleared as Allied troops began to arrive inland from the beaches. 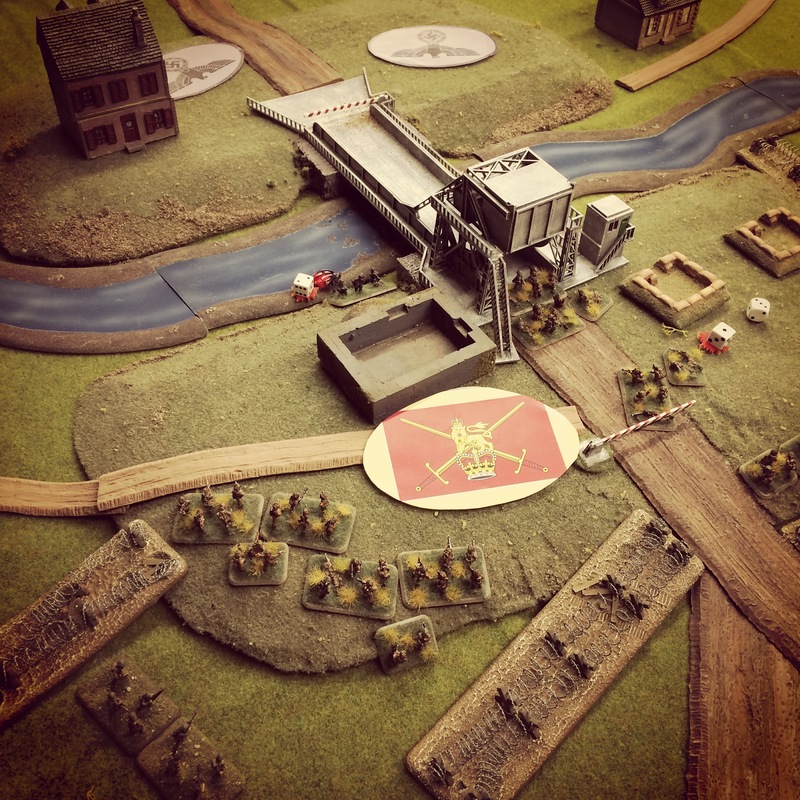 I’ve previously run a 15mm Flames of War scenario at La Fiere, so I was excited to scale up the battle to 28mm at Metropolitan Wargamers in Brooklyn, NY this past weekend. 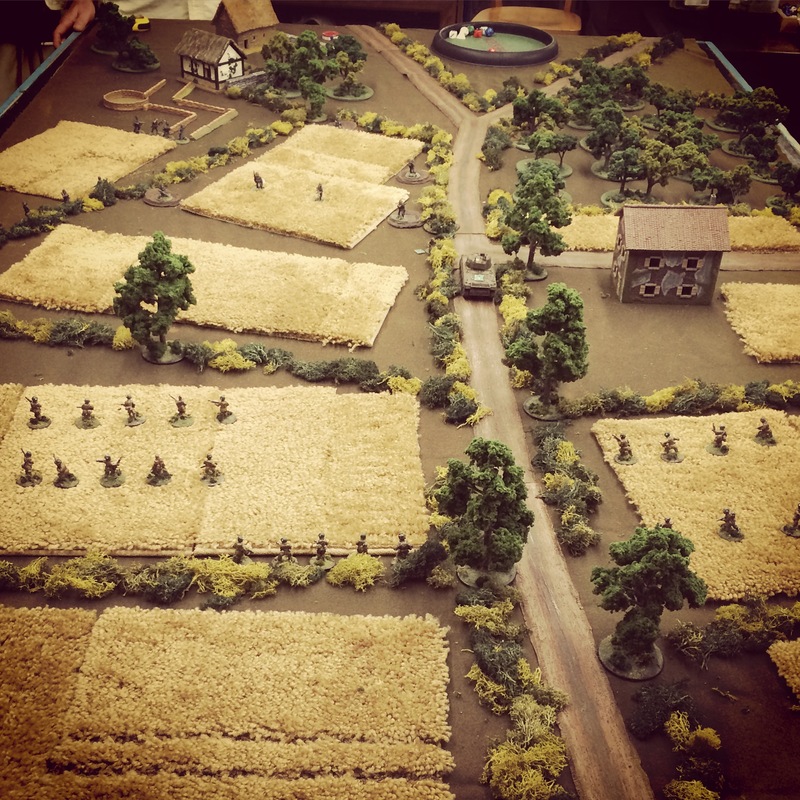 Our game at La Fiere once again came from the classic Normandy ’44 – First Hours scenario book from Skirmish Campaigns, and we used Battleground rules. 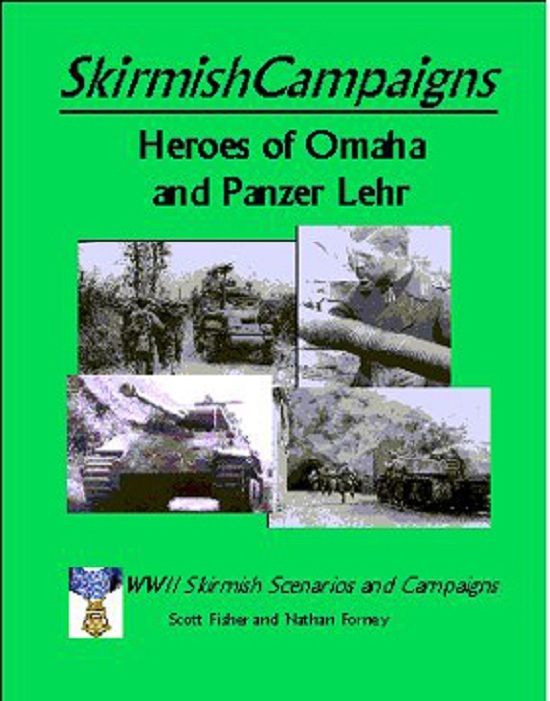 The Skirmish Campaigns series offers narratives, orders of battle and terrain layout maps that are brief and to the point, focusing on getting into the game as quickly as possible. 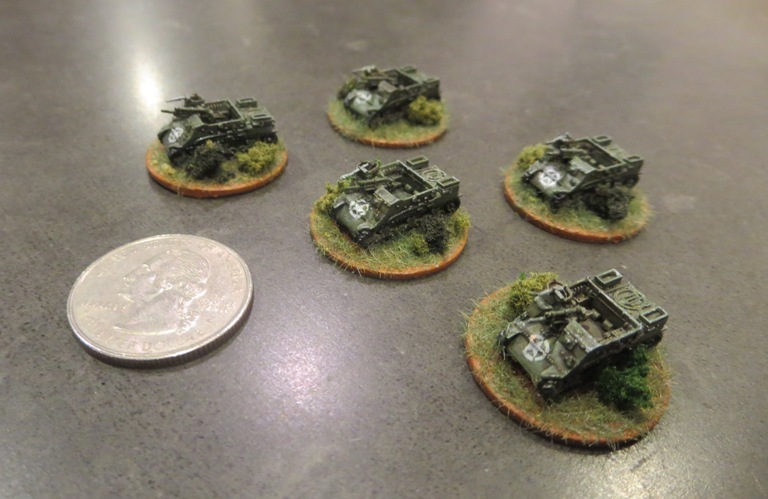 For our game at La Fiere, we modified the order of battle and added in my newly-painted Rubicon Models Sherman tank for the US and a German anti-tank unit I’ve also recently completed. 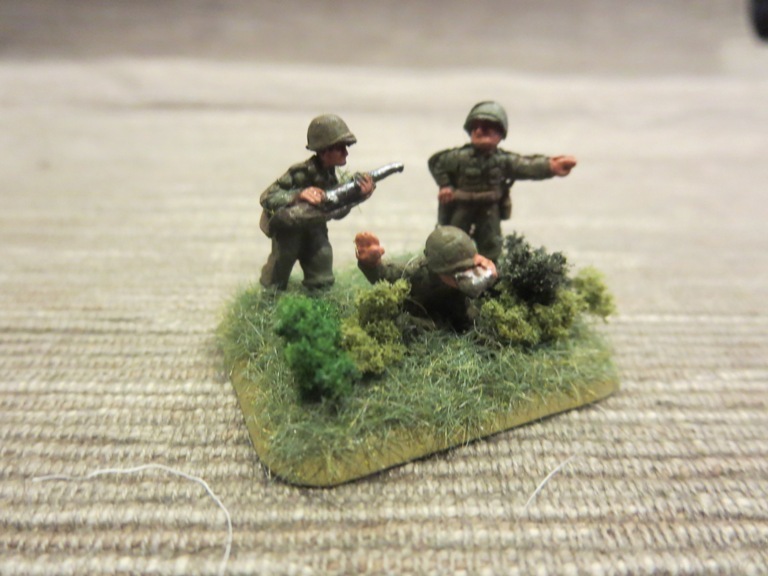 The rest of our forces came from my collection of 28mm German and US troops painted over the past year. 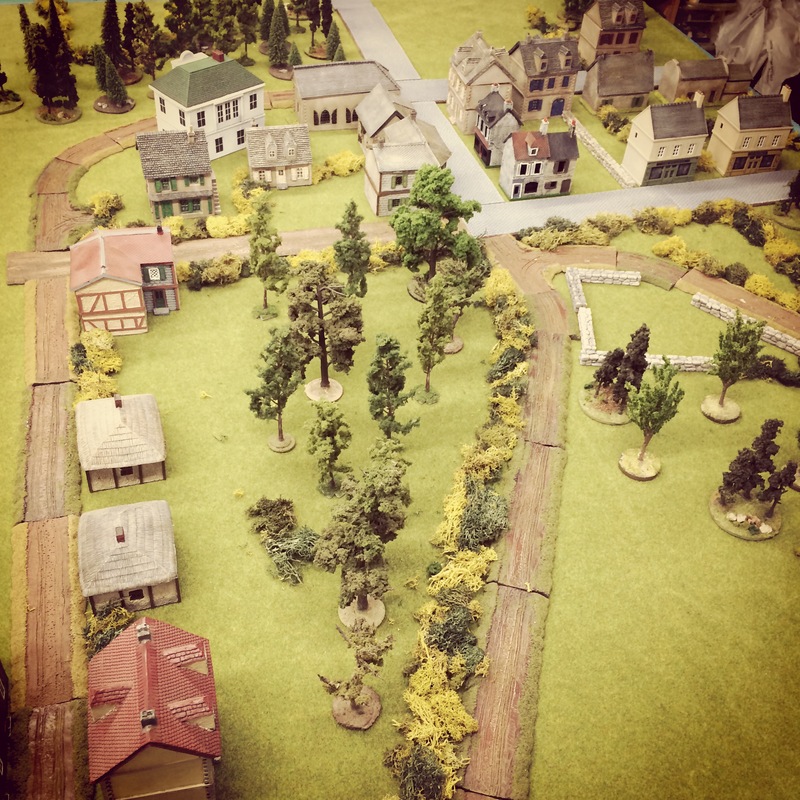 At the 28mm scale, we increased the tabletop set-up to a 4′ x 4′ board accommodating two main bocage-lined east-west roads, fields and a large stone house. 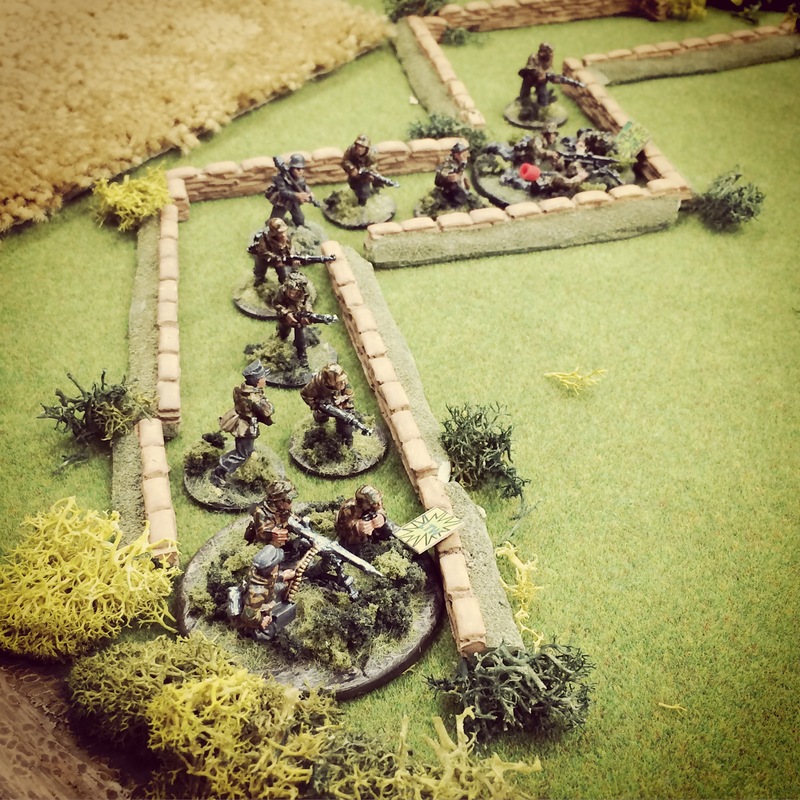 With an American objective to seize the house, the Germans set-up with an infantry team and light machine gun in a line of trenches stretching through the main field. The German command set-up in the top floor of the house with a tripod-mounted MG 42 and anti-tank unit armed with a Panzershreck and Panzerfausts ready to deploy from the rear of the building. Two small anti-personnel mine fields were also set — one to the east of the house and one protecting the northern end of the German prepared positions. 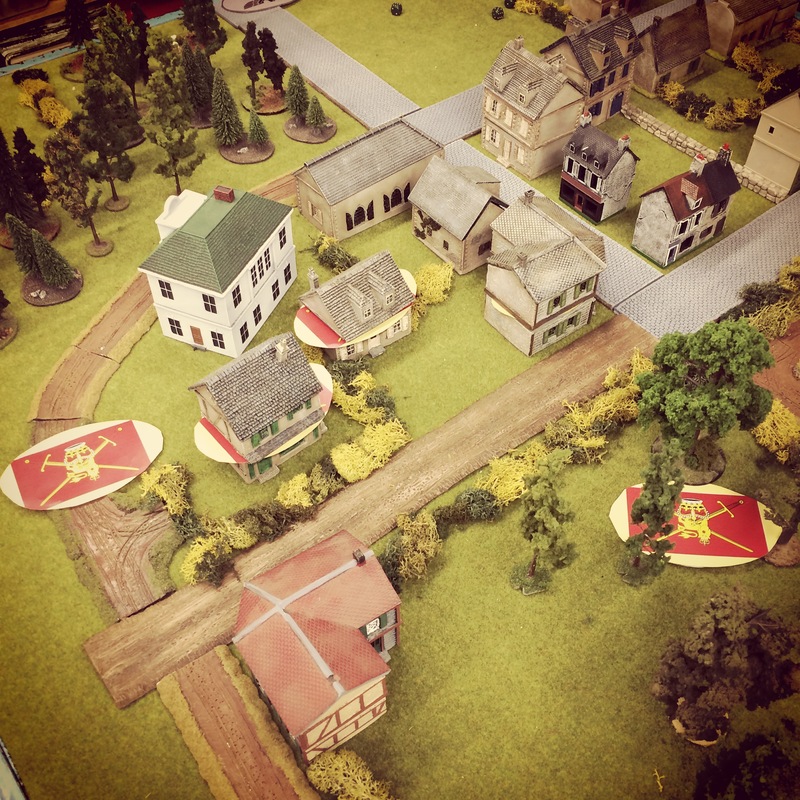 With a game time limit of ten turns, the game began with the US being given the initiative as the Germans lay quietly in wait. 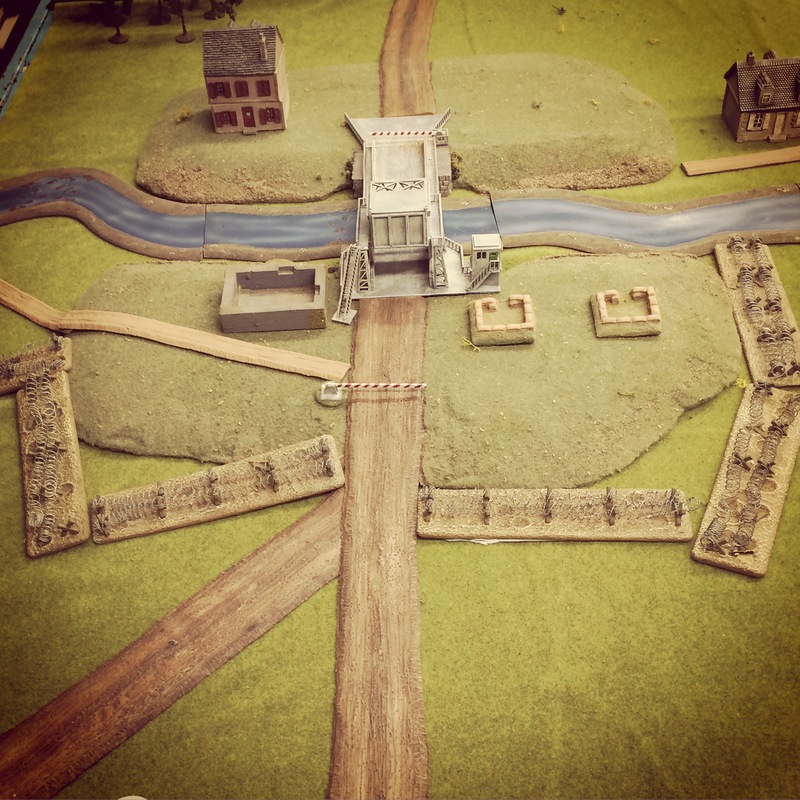 The Americans took the first two turns to move on from the far edge of the table to the east and their deployment quickly revealed their plan. 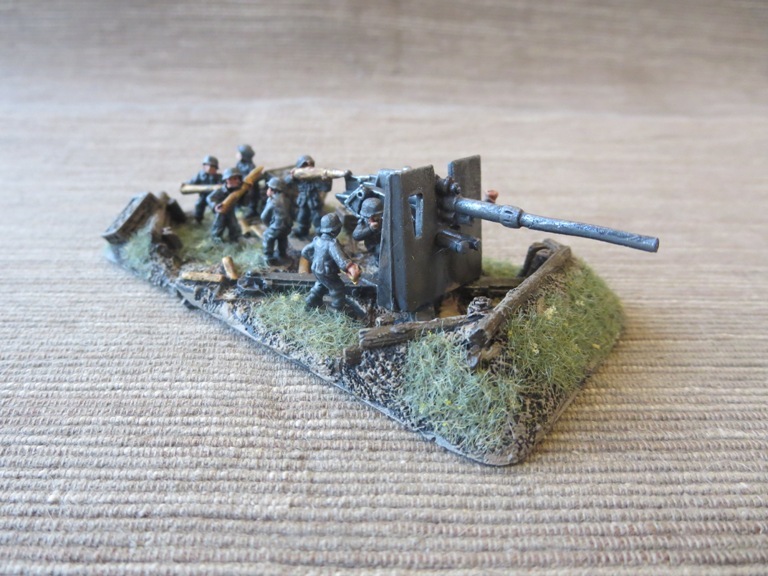 To their right, a M1 mortar crew set up behind a tree with their spotter creeping to the edge of the bocage to sight German targets across the field. 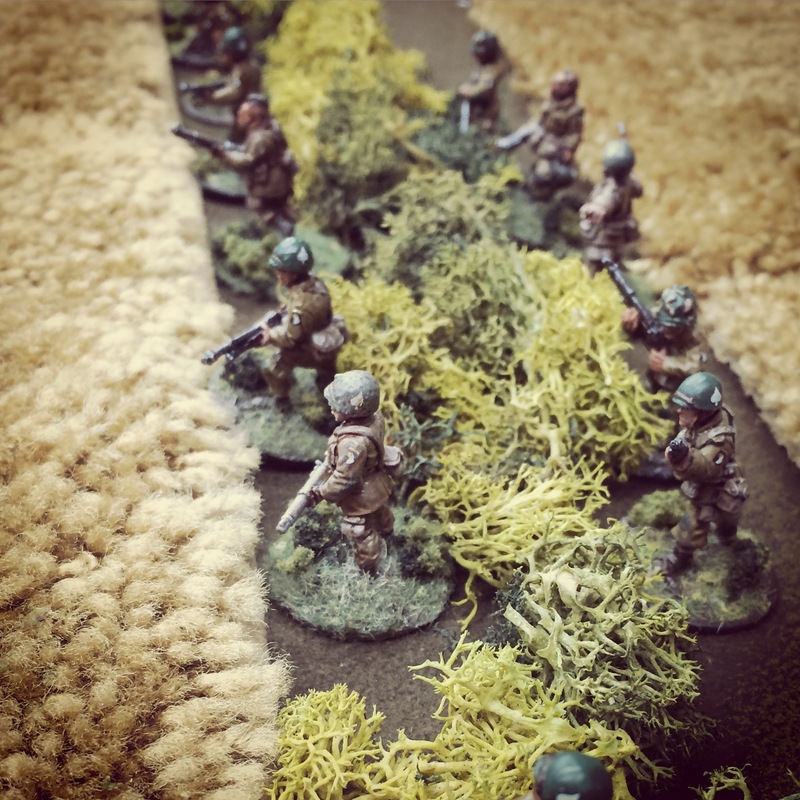 Next, a .30-calibre machine gun team set up at the hedgerow, followed by the HQ and a parachute rifle squad all stretched along the thick hedge. 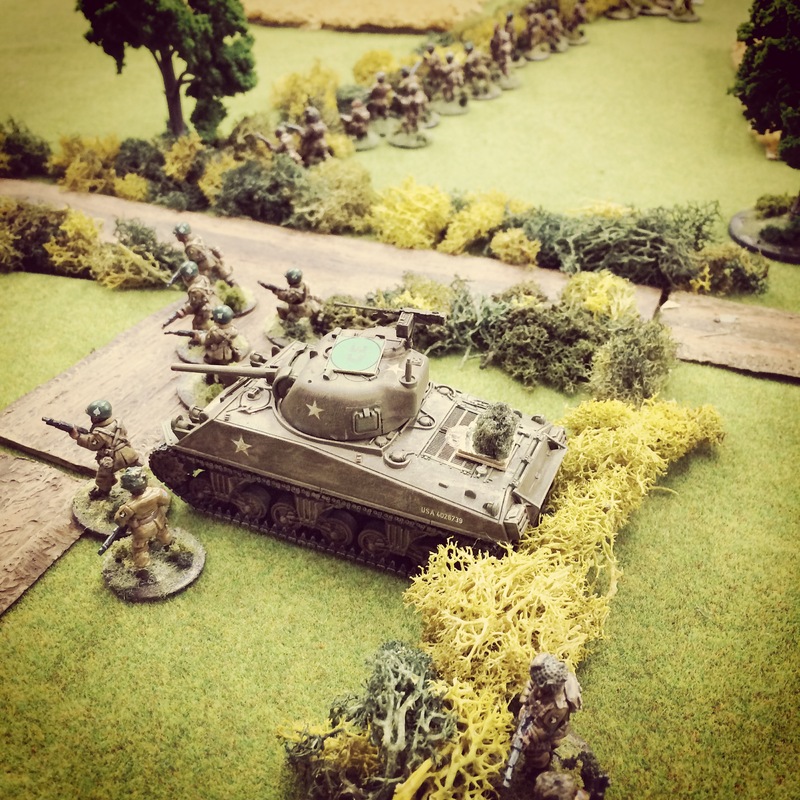 Across the road at the American left, one additional rifle squad moved in along the road with their Sherman rolling in support. 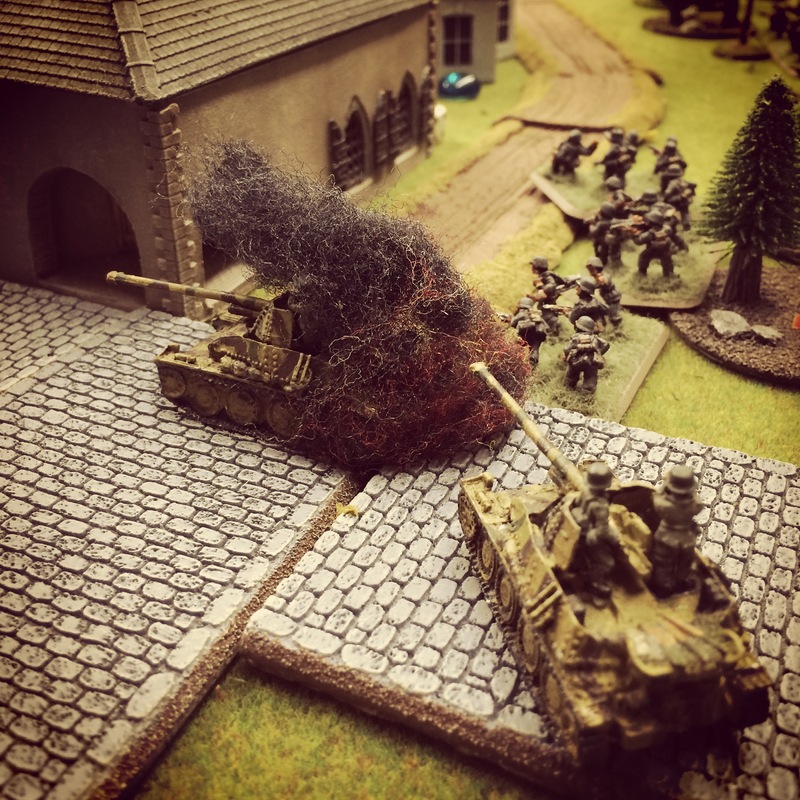 Clearly the US plan was to lock down the German forces in their prepared positions with combined mortar, machine gun and infantry fire as the infantry would push through the open field toward the house objective. 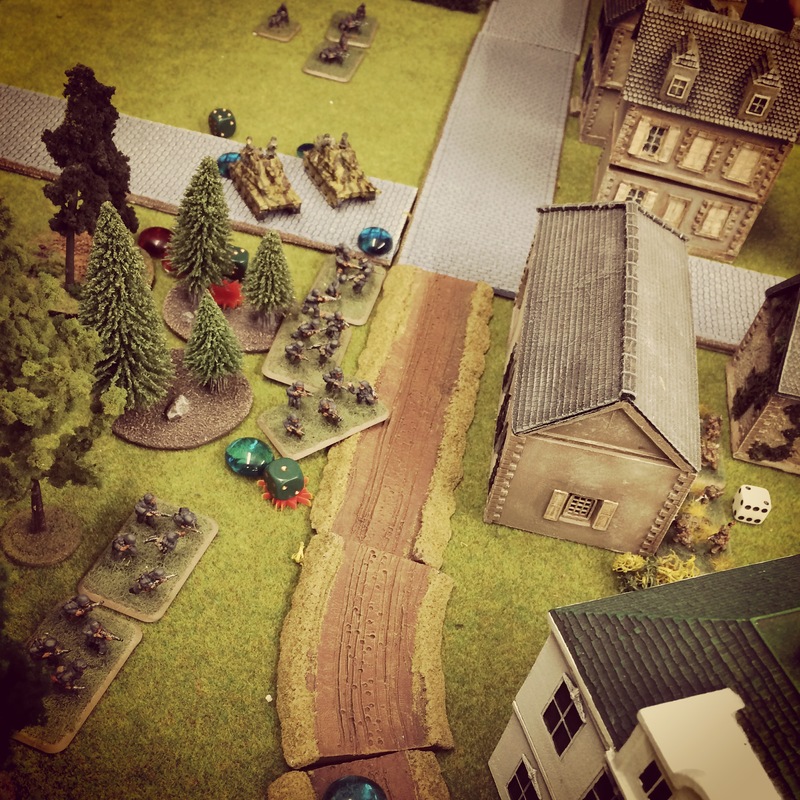 All the while, the balance of the Americans would creep toward the house using their tank for cover and intimidation. 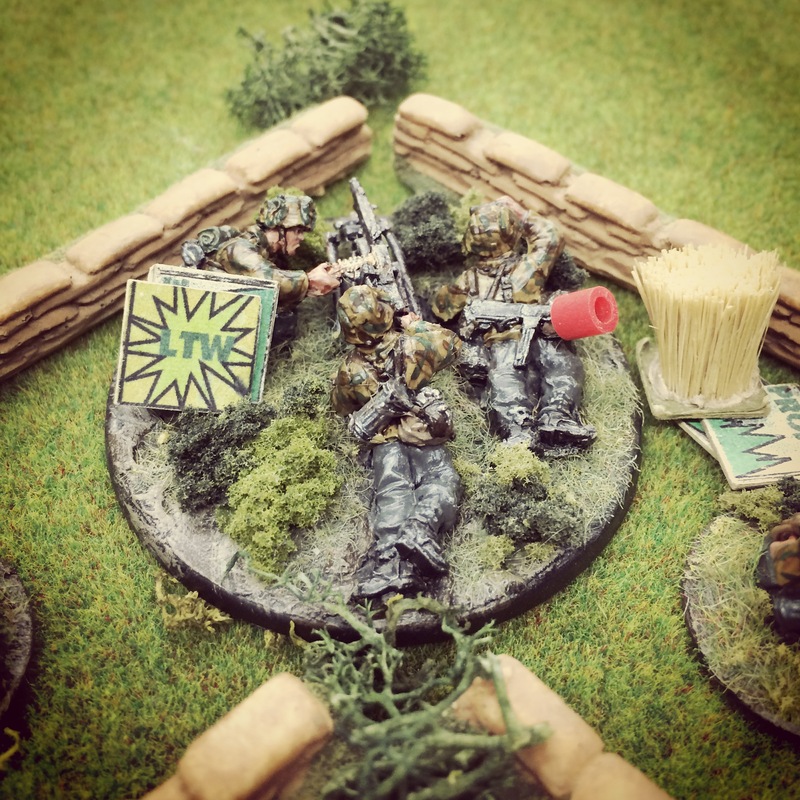 The mortar team confirmed the plan by launching two smoke rounds into the wide field at the end of the second turn, providing drifting cover for the next two turns. 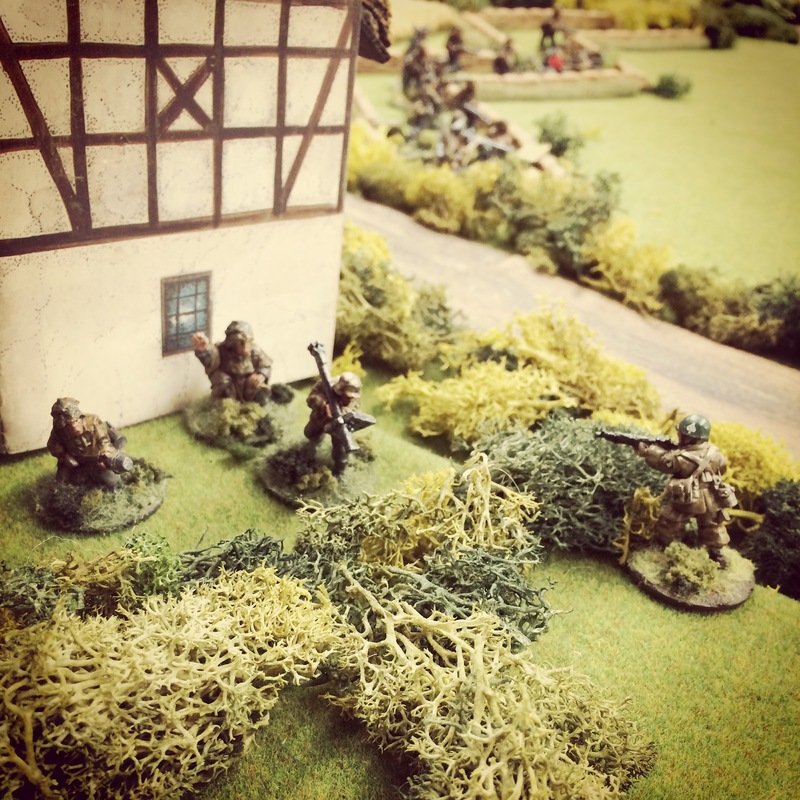 With the tank’s position revealed at the road, my Germans quickly moved their anti-tank squad around the house through turn three and lay in wait behind the bocage. The Germans also redeployed their tripod-mounted MG 42 to the far right of the trench to stave off the American advance in the field. 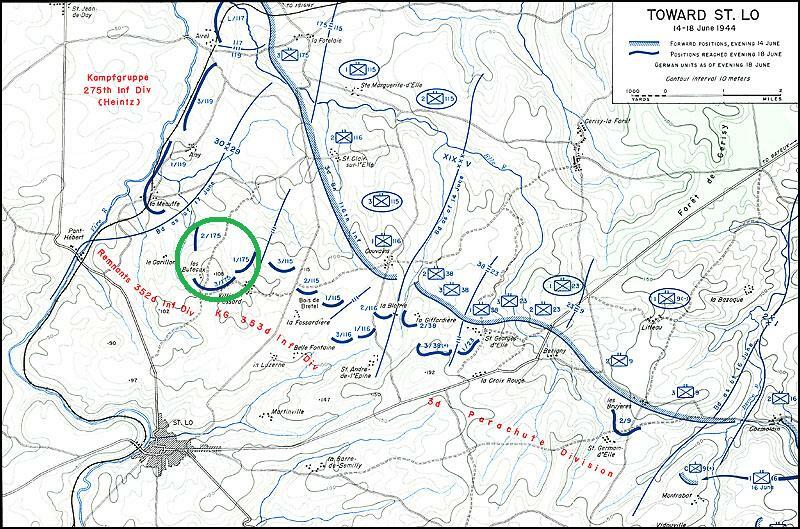 The German advantage lay solely in their defensive positions, and all they had to do was survive. The Americans were going to have to abandon cover early in the game, but they superior numbers, elite troops and better weapons. Plus, the airborne had a tank. 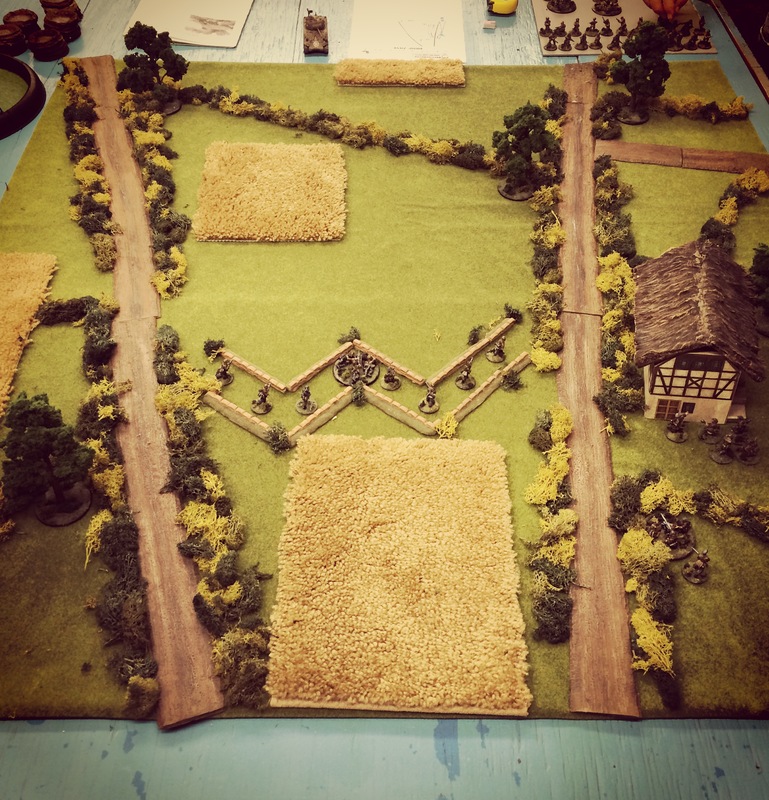 There were few targets for the Germans soldiers to shoot at through turn four, and they had difficulty spotting through the smoke and distance across the field. 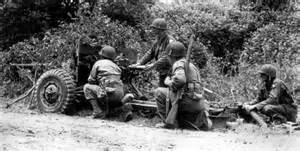 The American machine gunners managed to lay down steady fire each turn, forcing some Germans into prone positions, wounding others but not scoring any kills. The American plan shows signs of unraveling early on as the mortar began failing to repeatedly to sight and range in effectively on any German targets in the trenches. 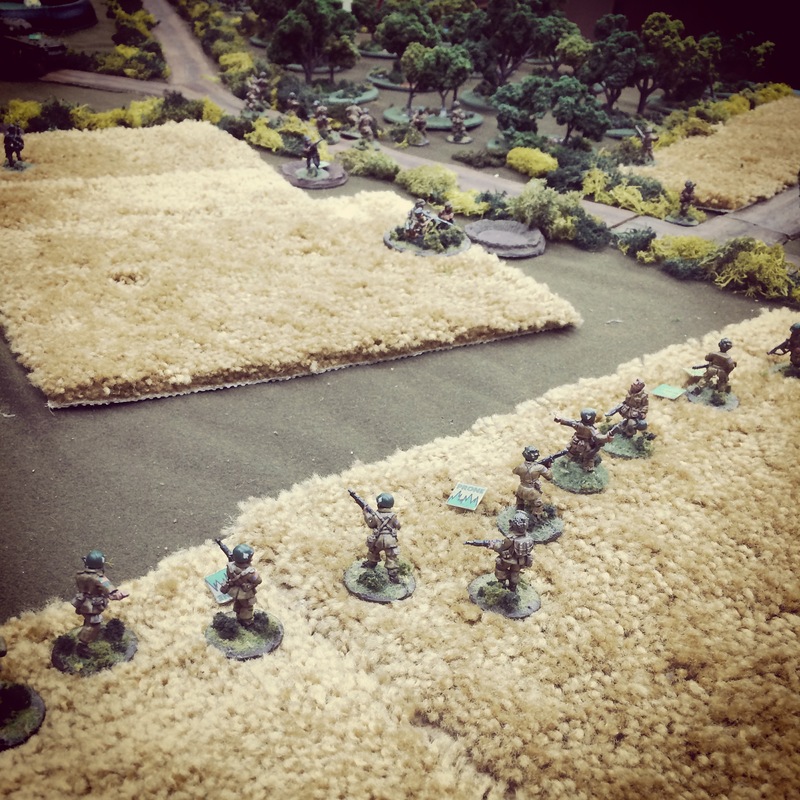 The only other alternative for the Americans was to simply start pushing across the field in the open. 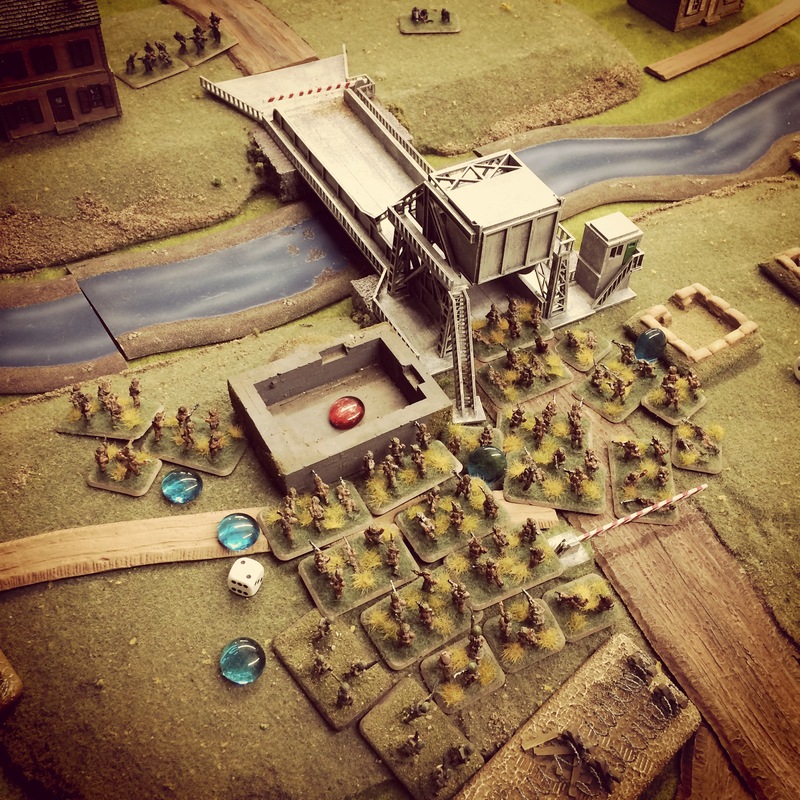 With the heavy German machine guns at their center and right jamming and the crew taking fire, the US airborne began a slow advance by turns five and six. Infantry fire from the US included three dice from each Thompson submachine gun and two dice for every M1 rifle. As the paratroopers closed in, grenades were also thrown and knocked the German tripod MG 42 out of commission. All the Germans could answer with were single dice from their rifles and three dice for submachine gun shots from the officers, all in fewer numbers than the larger US squads. 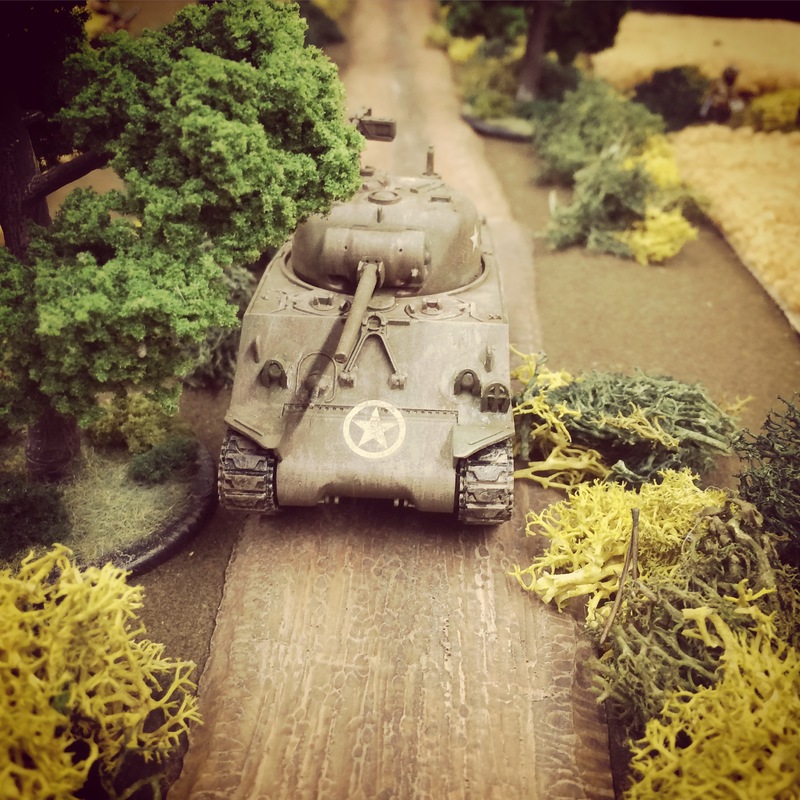 Across the road, the second American rifle squad crept along on either side of the bocage with the tank rattling along beside them. 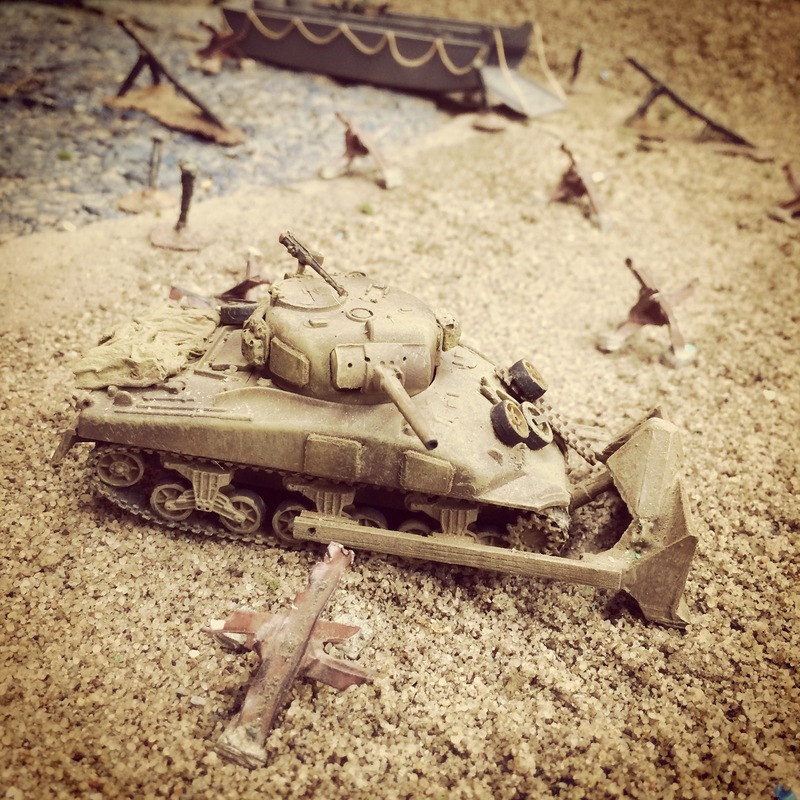 As the first troops closed near the house, the first minefield was exposed but no Americans were injured as they continued on at a slower pace. 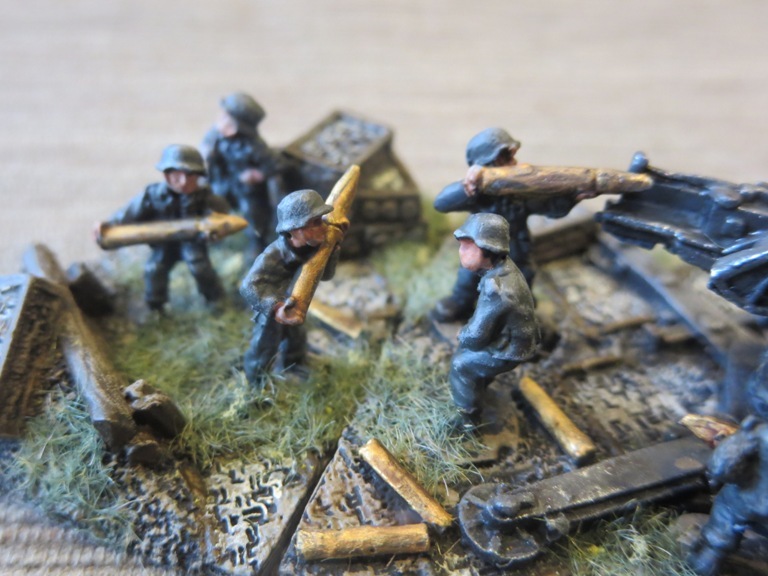 Their delay allowed the German anti-tank crew to move into position, firing a few rifle and submachine gun shots along the way at the airborne tip-toeing around the mines. 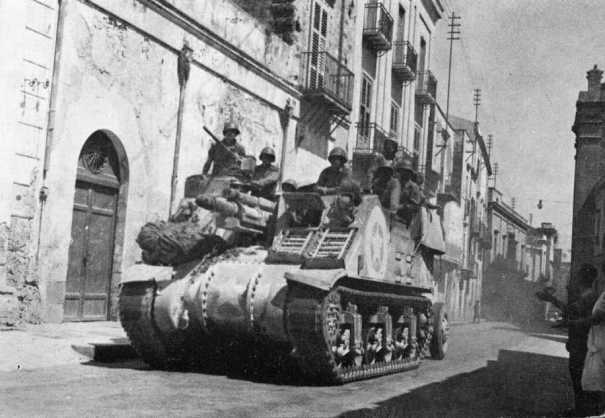 With the tank finally in sight, the Sherman opened up with opportunity fire from its hull, turret and top-mounted .50-calibre machine guns. 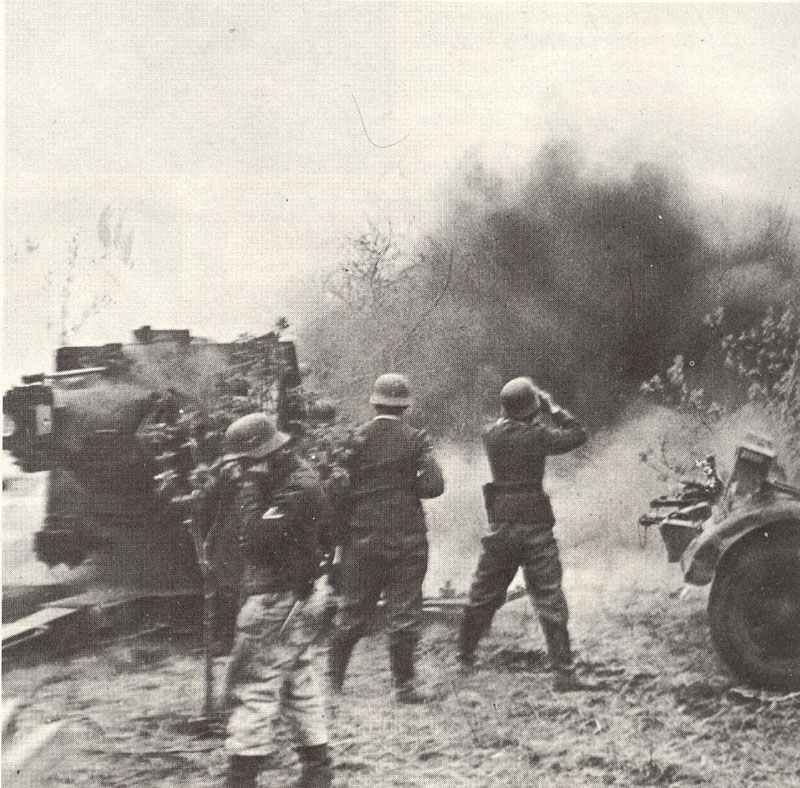 Under a hail of bullets, the anti-tank crew went prone and took light wounds, disallowing their planned shot at the tank for the turn. 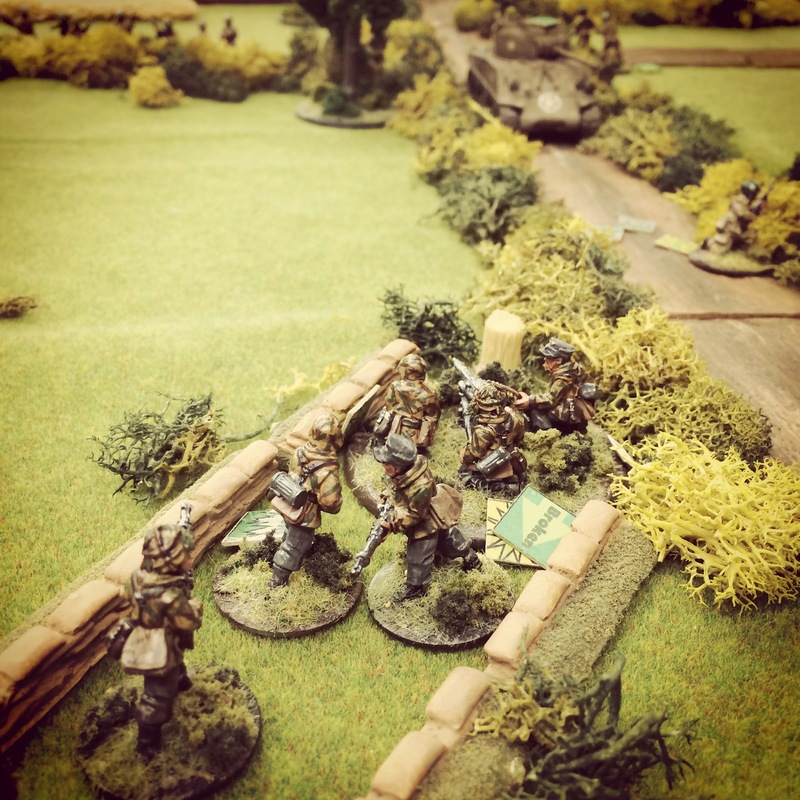 By the sixth turn, the assistant gunner was able to crawl to the injured Panzershreck and deliver a crippling shot to the tank’s front track. 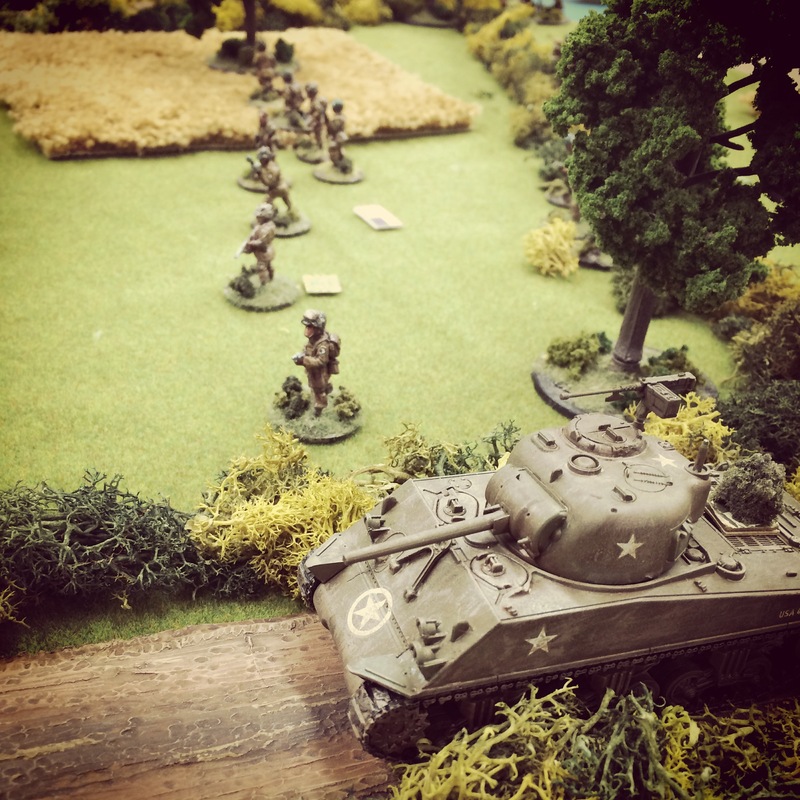 Rolling for morale after the hit, the American crew rolled a ’20’ — the worst possible outcome — and fled their tank and the field. 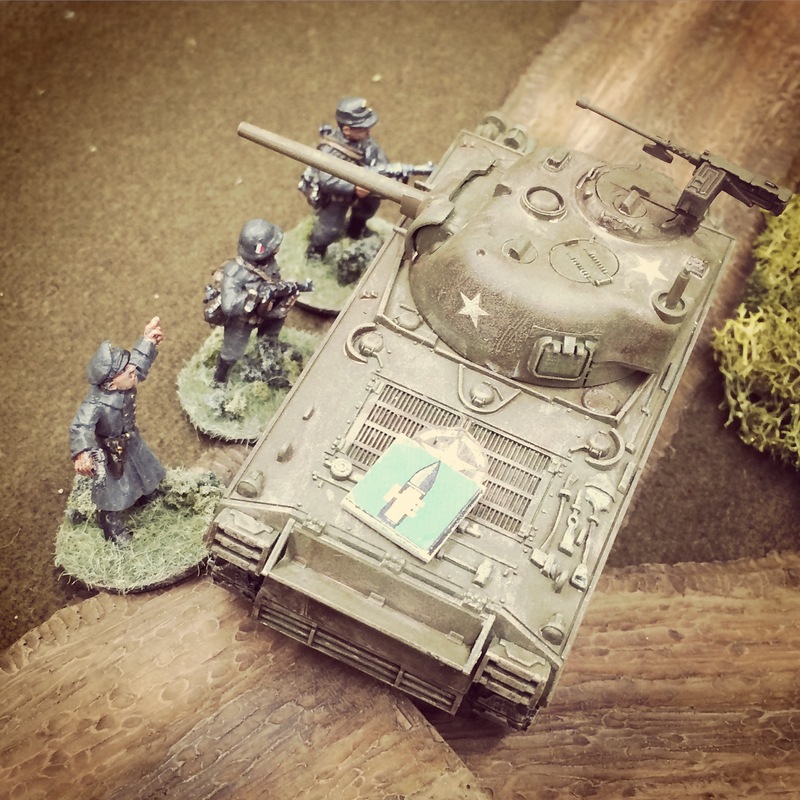 With the tank out of the battle, the airborne infantry were left alone to do the job. At the seventh turn, the first US troops to close on the building were mowed down under heavy fire from the German HQ inside the building. 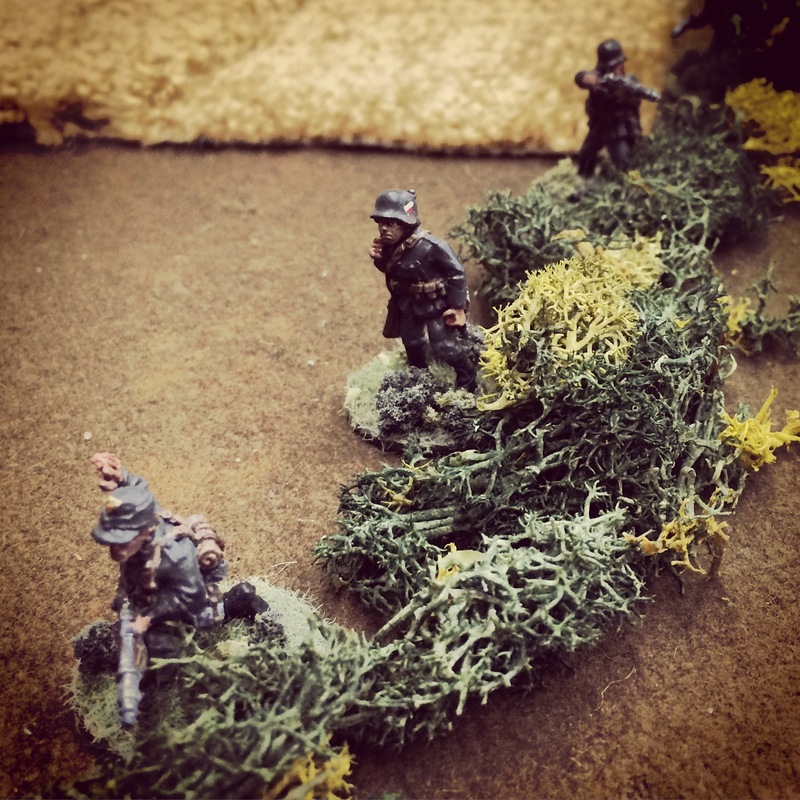 The German survivors in the field trenches held out against three waves of US advances. In the open and with no heavy support, the Americans were eaten up in the field despite their superior training and weapons. 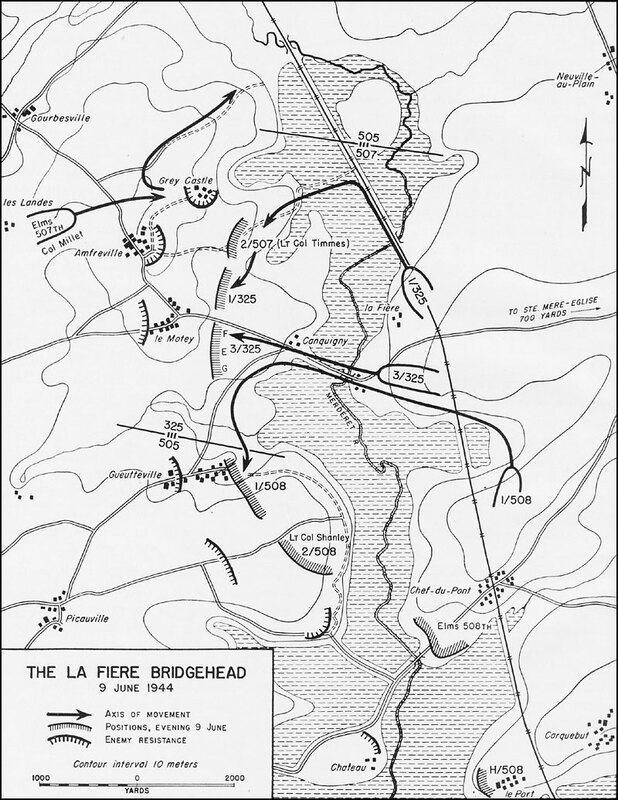 Against the odds, the German forces had thrown back the US airborne’s advance on La Fiere. 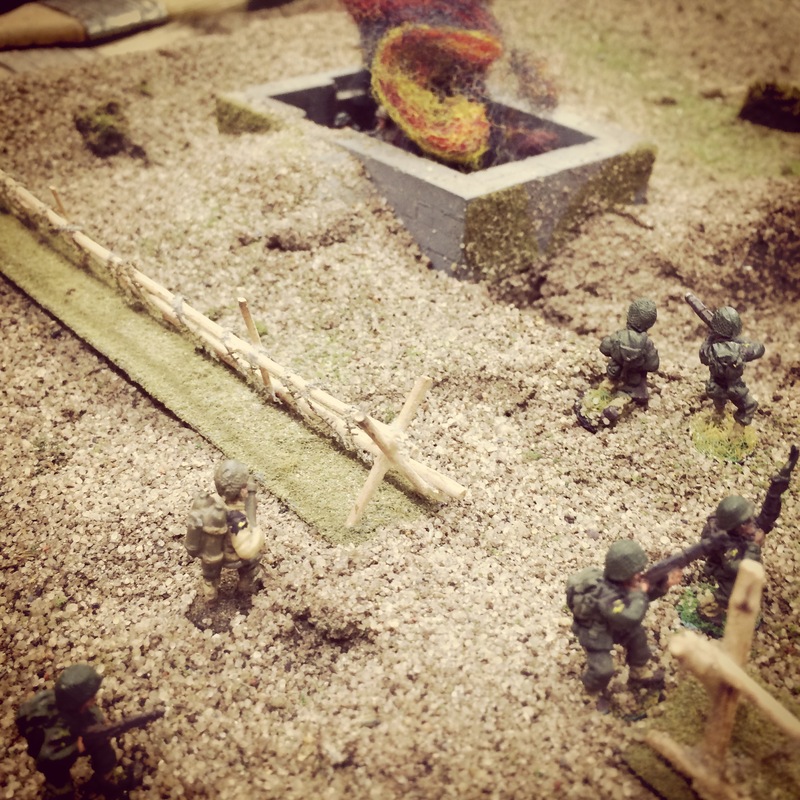 Playing a 28mm battle with the Battleground skirmish rules gives an incredible amount of detailed feel to the game. 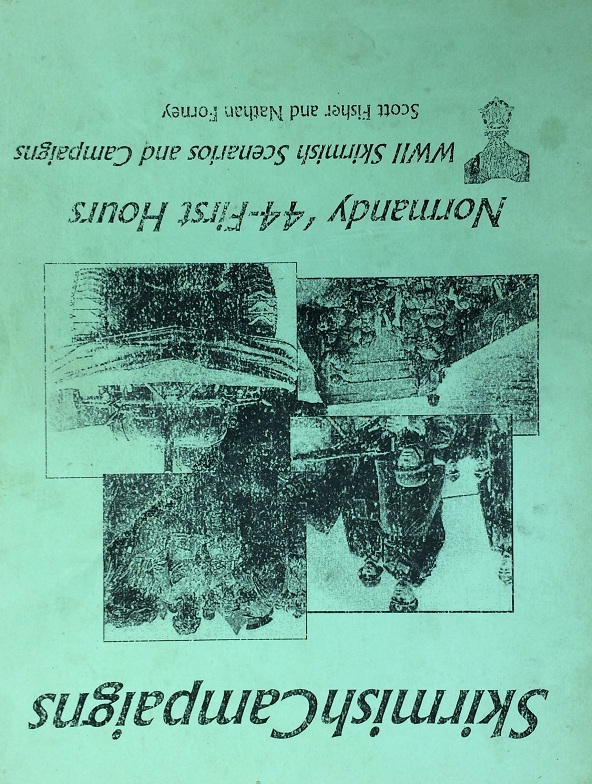 Wounds, suppression, weapon jams, moving, loading, spotting, morale checks, cover and troop quality all intertwine to effect each figure individually as they contribute to the overall mission of their force. Under battle conditions, unlikely things — like mortars being completely useless or a tank crew fleeing the field– can and did happen. In our game, a well-laid plan by a superior American force was thwarted by Germans who just kept hanging on as the dice went their way. 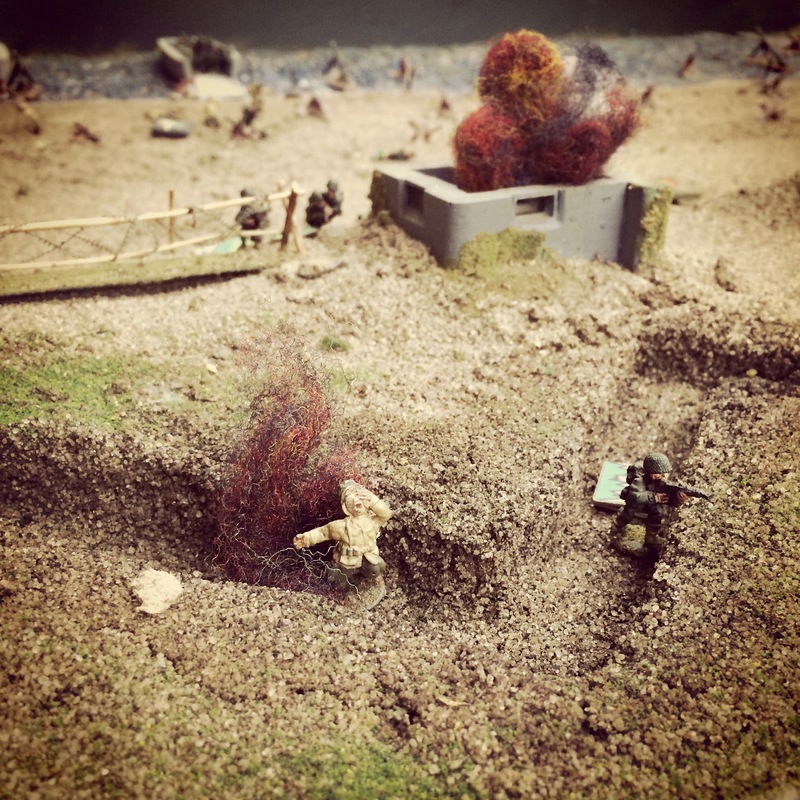 The action at the “Uncle Red” sector of Utah Beach on D-Day June 6, 1944 is a favorite at Metropolitan Wargamers in Brooklyn, NY. 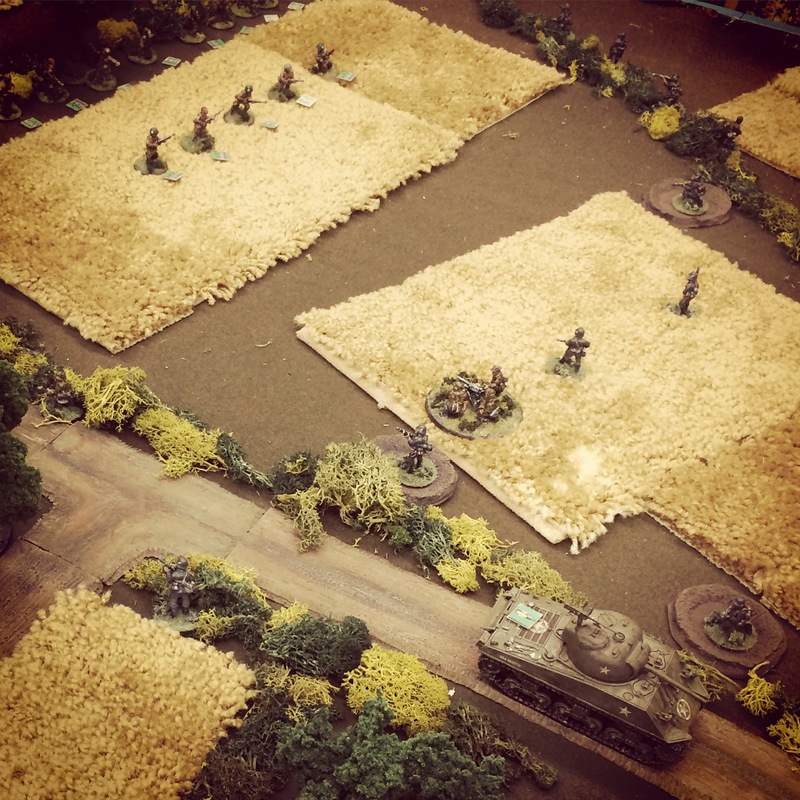 Using one of the club’s sand tables, we have previously run the scenario for Flames of War in 15mm, and this past week we had a go with a game in 20mm using the Battleground skirmish rules. 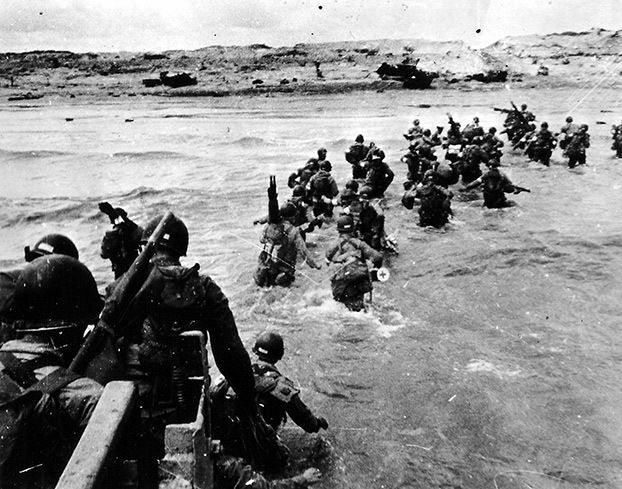 The US 4th Infantry Division’s landing was less murderous than the casualties experienced by the Allies at Omaha Beach, but the German 709th Infantry Division’s defense was still substantial. German fortifications eventually fell to US assaults by both infantry and timely tank support arriving successfully on the beach. 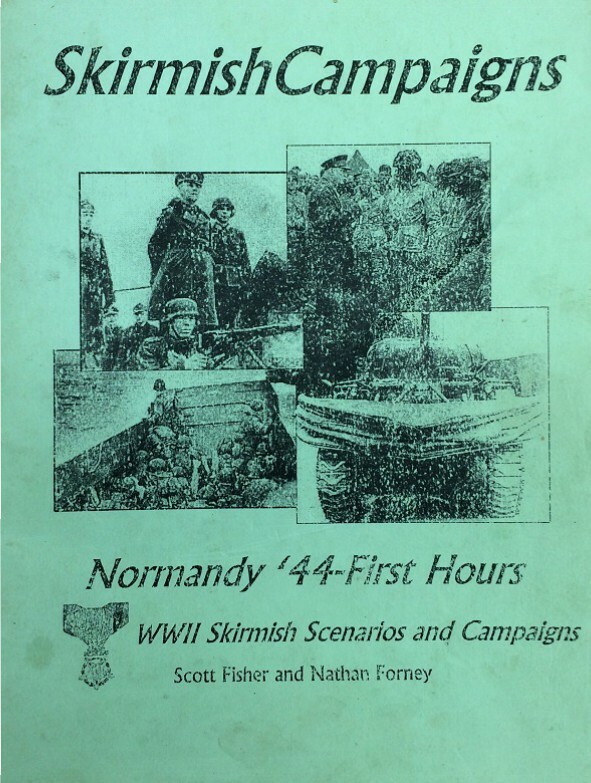 We’ve been enjoying World War II scenarios at the skirmish level in both 28mm and 20mm, allowing for a more detailed feel to our games taken from the well-researched and detailed Skirmish Campaign books, including the Normandy ’44 – First Hours book. 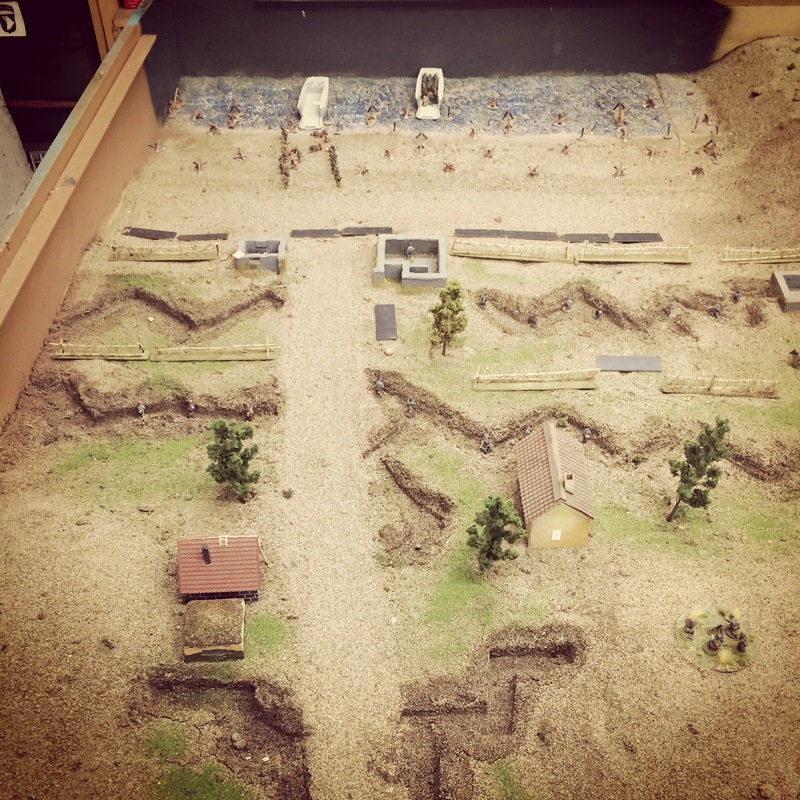 The table’s layout featured a heavily-defended beachhead with German machine guns firing from three coastal bunkers, lines of barbed wire, mines and trenches carved into the sand. 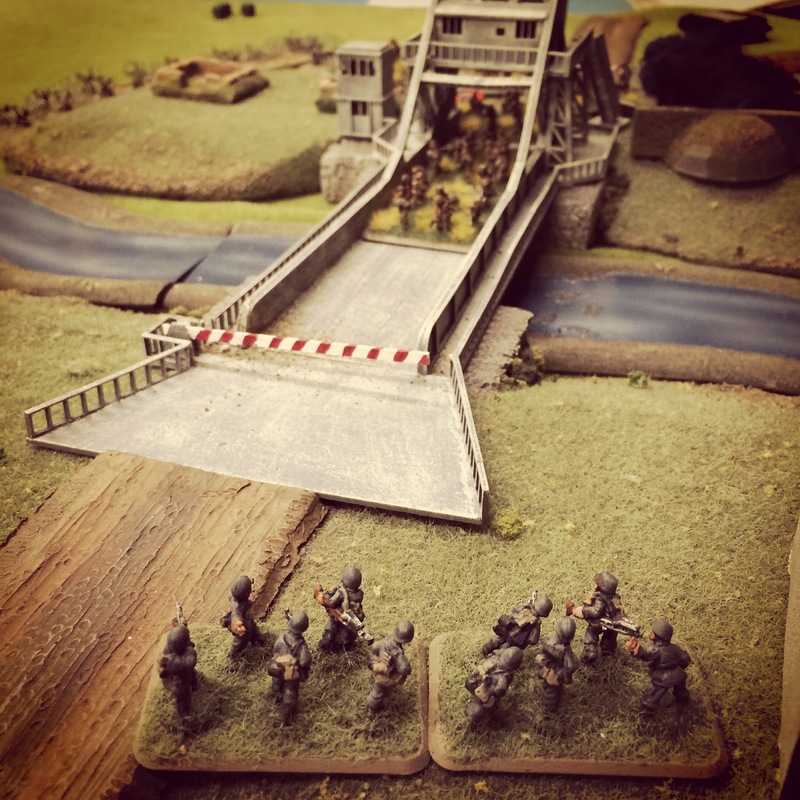 The short, eight-turn scenario presents the Americans with the objective of taking the three bunkers at the seawall plus one at the rear of the table. 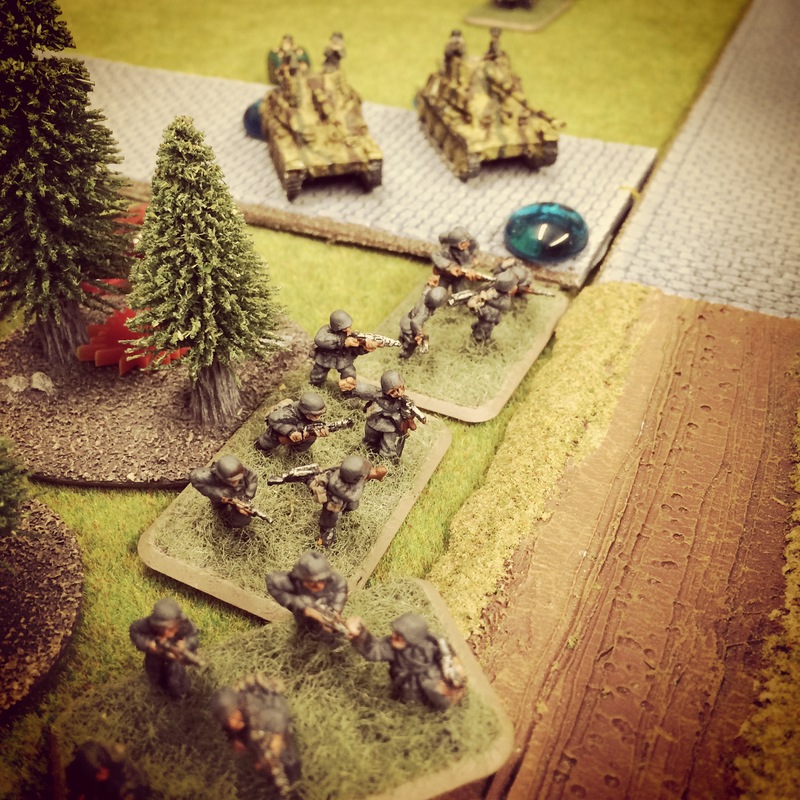 The Germans must simply hold off the US invaders from seizing their objectives. 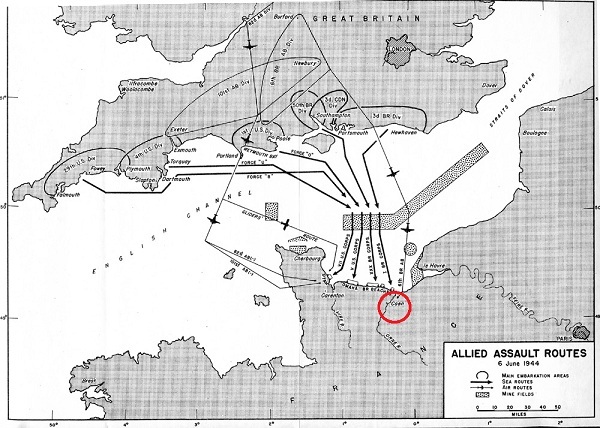 US arrivals began with one boat of infantry arriving in each of the first two turns. 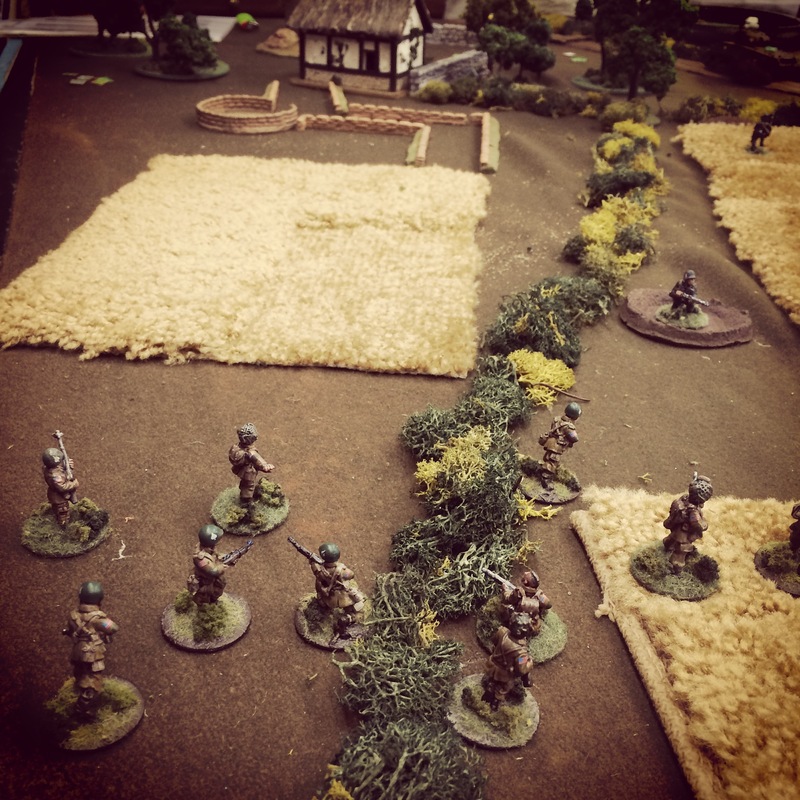 The Americans used both of their actions in each turn to push forward on the beach with an eye on assaulting the bunkers at the German center and left. Under no cover on the open beach, the US soldiers took heavy crossfire from German machine guns in each of the three beach bunkers and one squad of infantry tucked behind barbed wire in trenches. The first two turns were deadly. 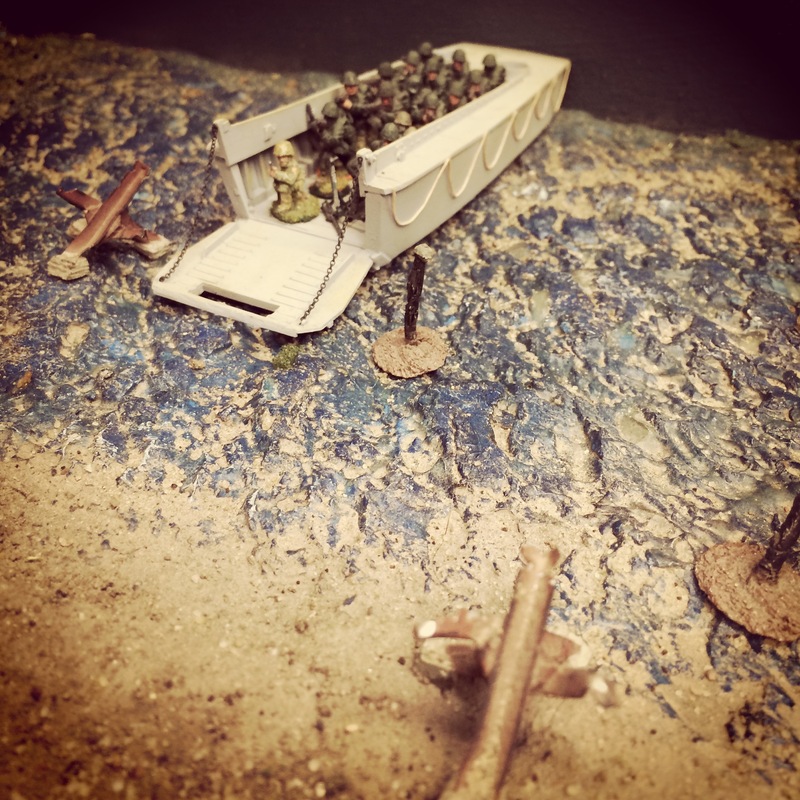 One American squad were reduced to half strength by the time they pushed toward a gap in the minefields and on to their first bunker objective. 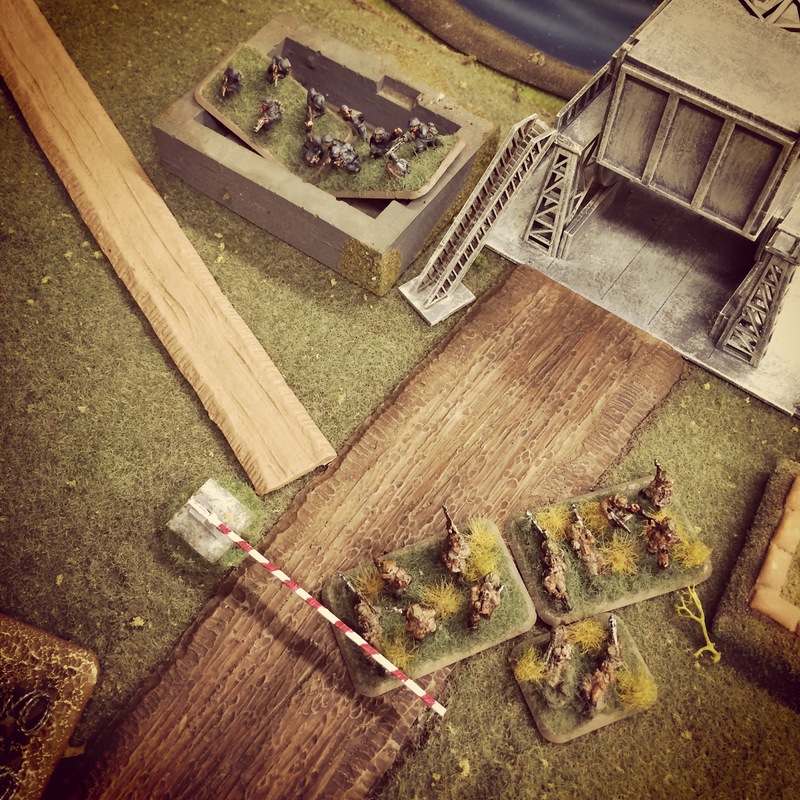 Combined fire from the US poured into the bunker, cutting the German machine gun’s crew to a barely functioning unit as the Americans swarmed forward. 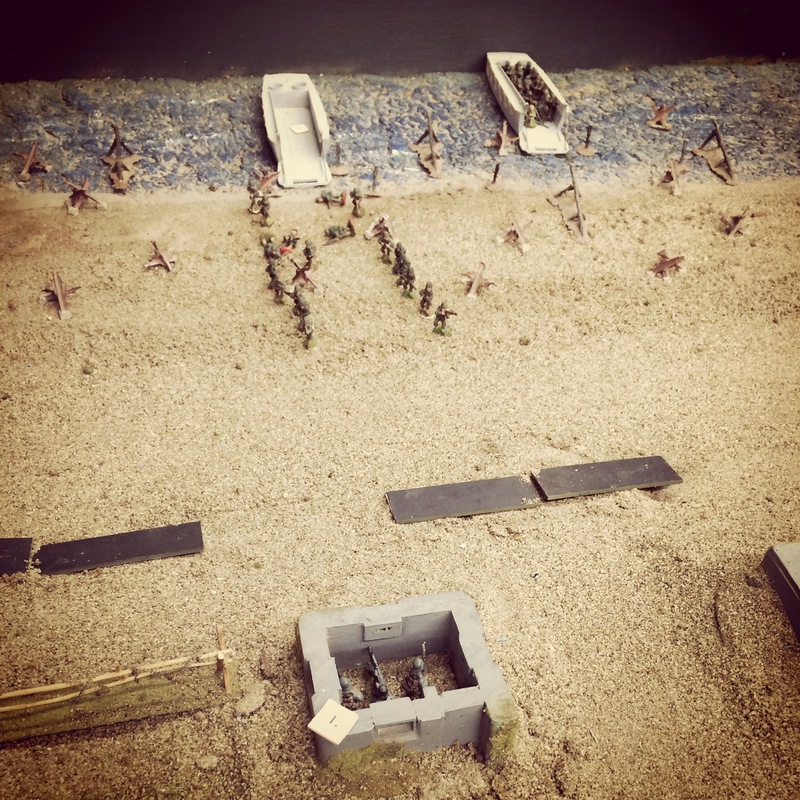 By turn three, the Germans in the trenches had shifted left to cover the oncoming Americans just breaching the seawall. 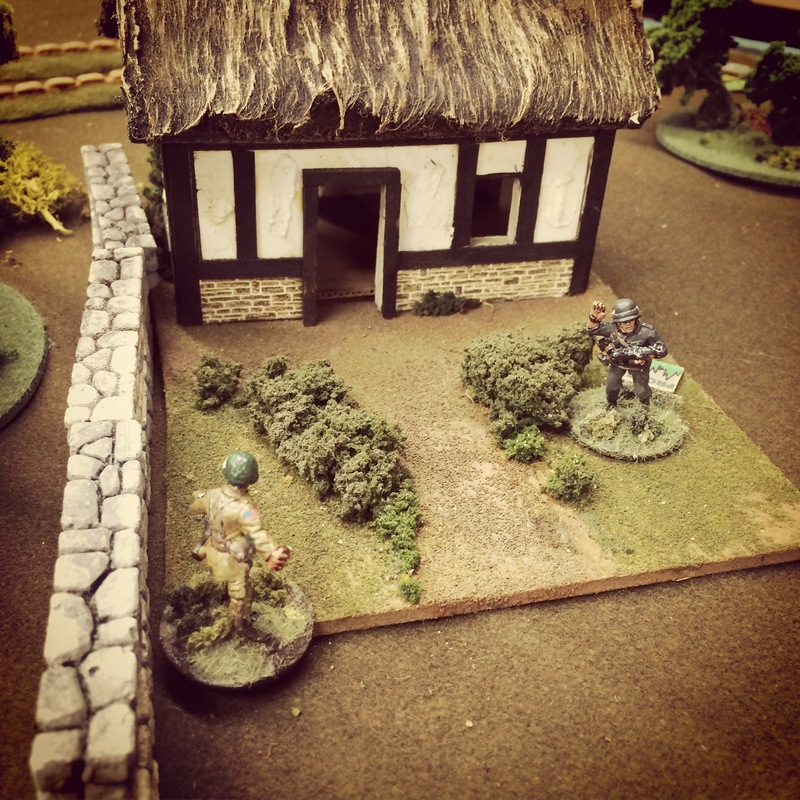 In a close frontal assault the first American squad managed to lob a grenade into the German bunker, incinerating the remaining machine gun crew inside. 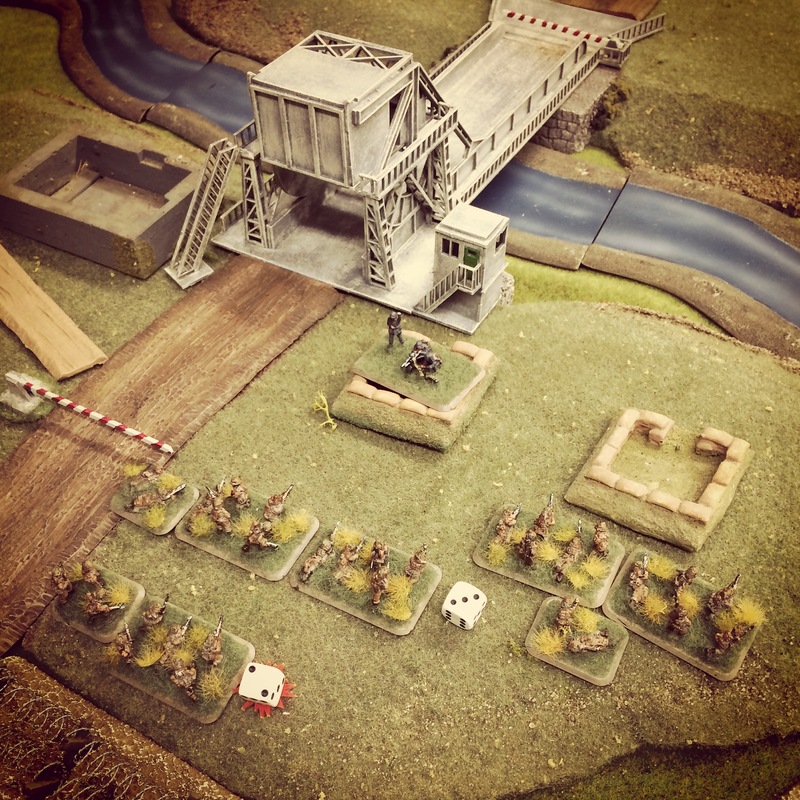 With one objective one, the GIs set their sites on the bunker at the rear of the table beyond trenches, barbed wire and weakened German forces. 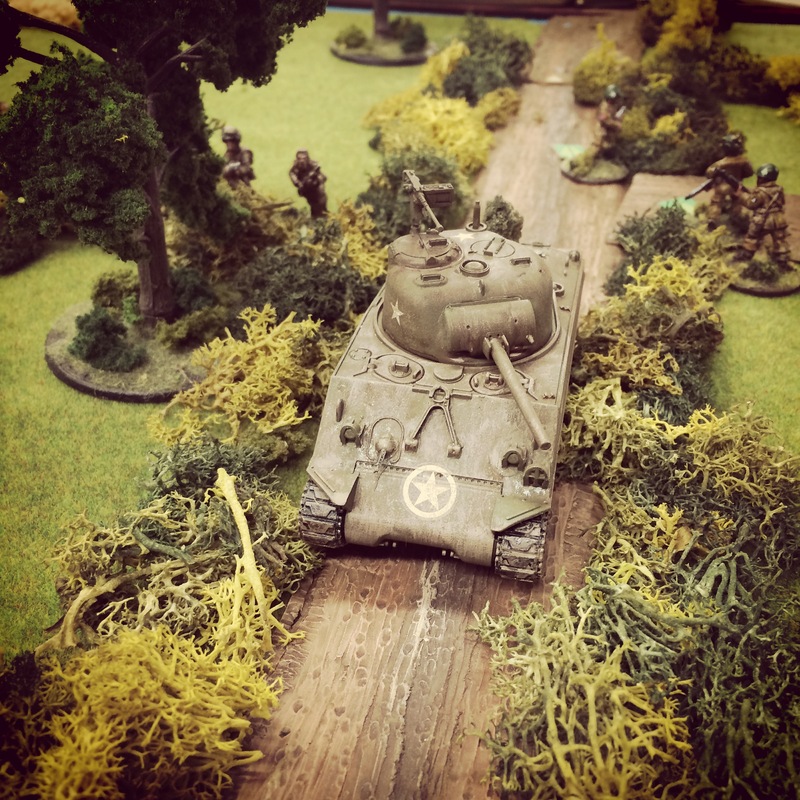 The US Sherman and final boat of engineers arrived in turn four and immediately made way for the right side of the German lines. 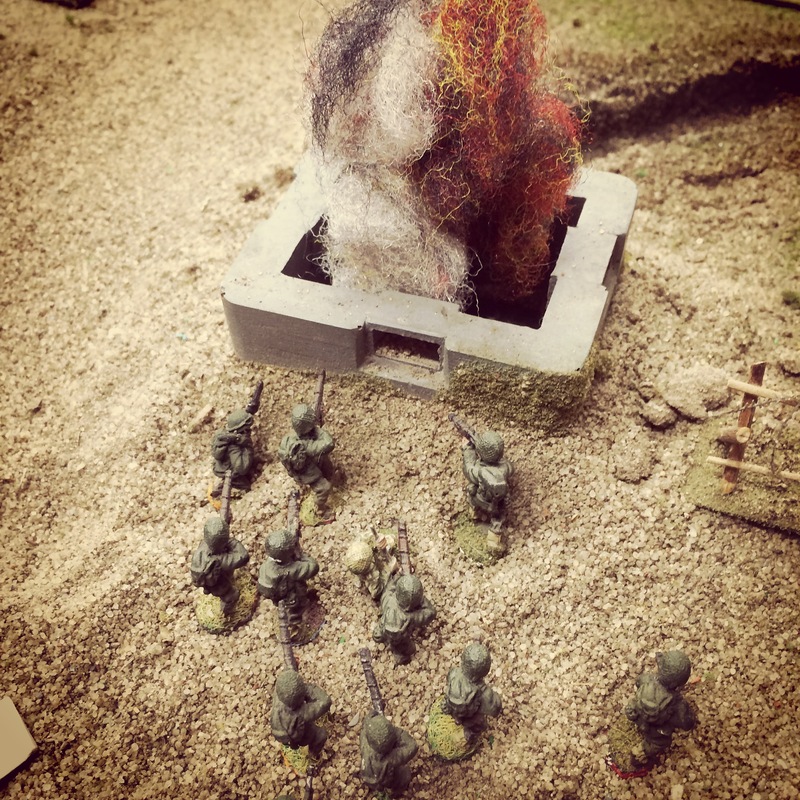 Exploiting a gap in the wire, the fresh squad made quick work of the bunker on the German right with a blast from a flamethrower in turn six. German infantry at the center trench were cut up through combined HE rounds from the Sherman on the beach and close fire from the encroaching American squad. Back at the German left, the initial US success became hung up in a tangle of trenches and barbed wire just beyond the burning bunker. German survivors at the second row of trenches tossed grenades and opened fire on US troops, and the Americans answered back likewise. 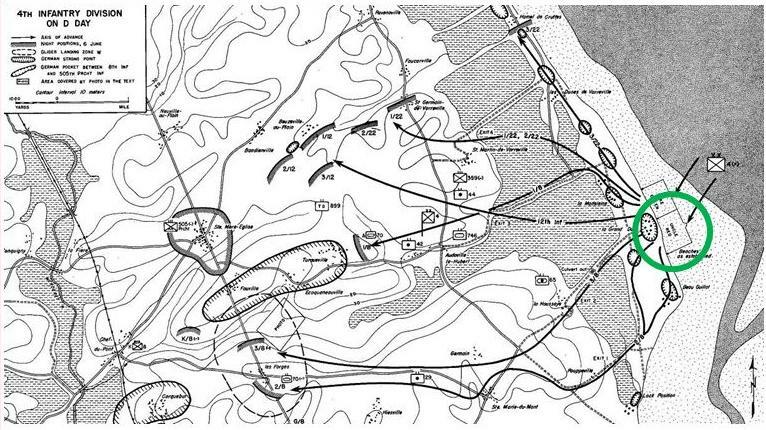 In the bloody close action, the Germans offered just enough delaying actions while taking heavy casualties. 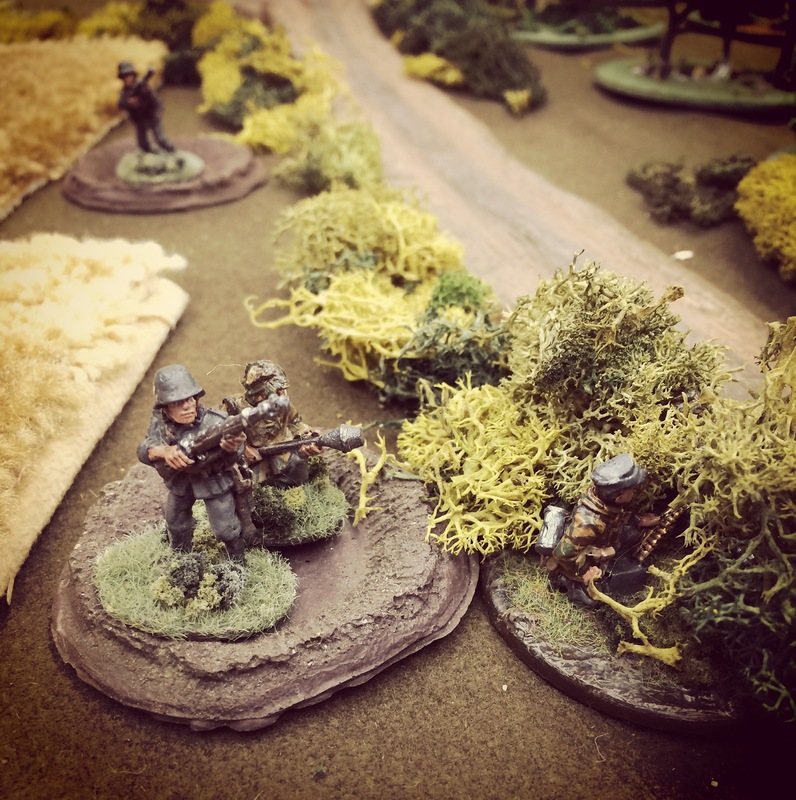 By the time the Germans began to break in turn seven, the American forces were in no position to seize their final two objectives by the game’s end. 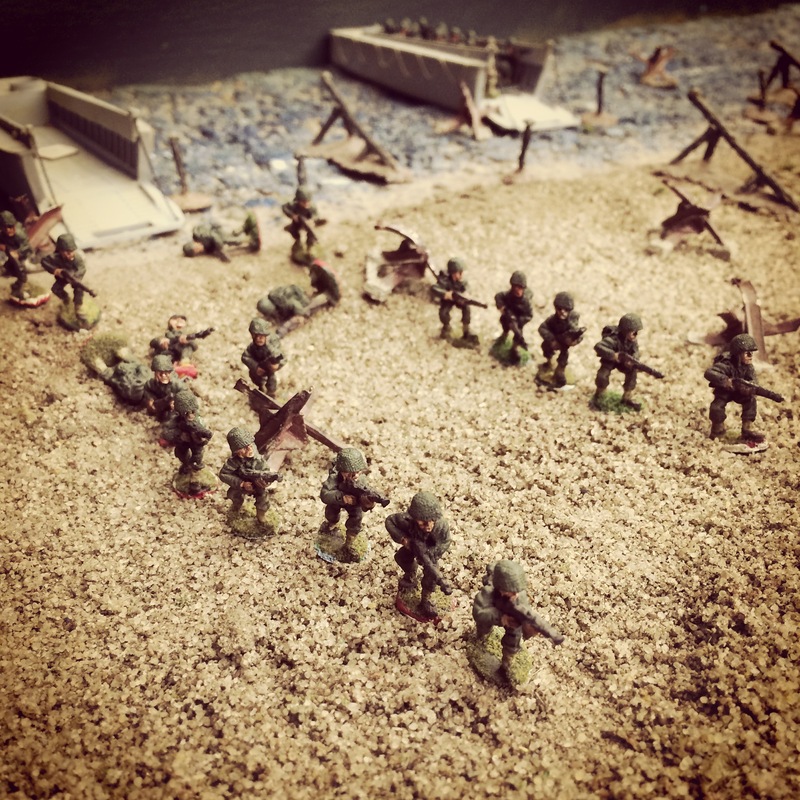 Despite the aggressive American fight, the beach was held by the Germans. 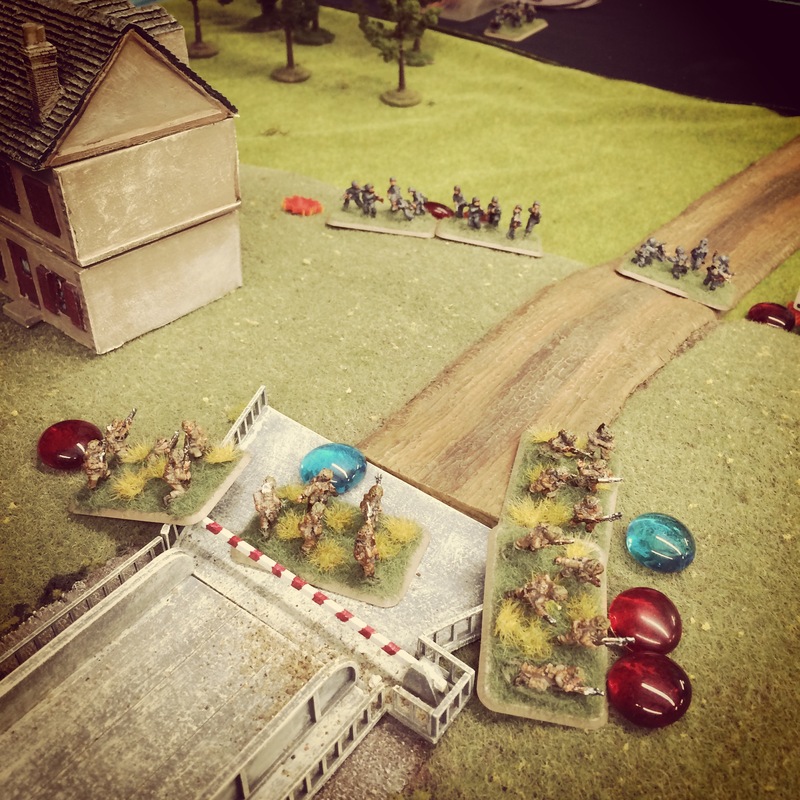 Having played the Uncle Red scenario now several times using Flames of War rules in 15mm, we really liked the nuance of play at the skirmish level in 20mm. 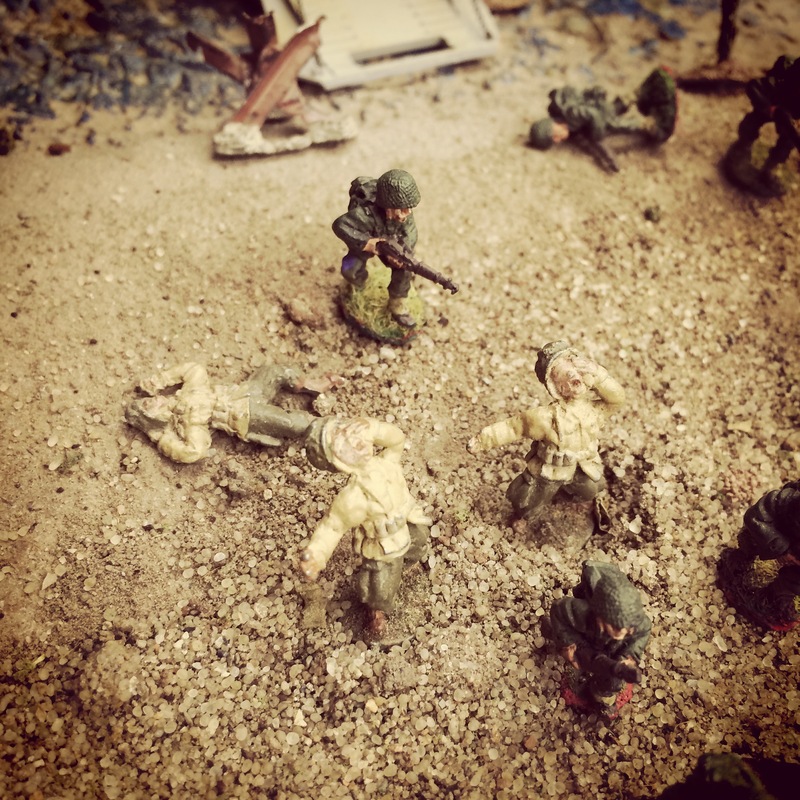 At the larger scale, individual losses and heroic actions seem to mean more and can swing the game from victory to defeat in a heartbeat on the sandy tabletop beach of Normandy.